Over the past few years, the Center's appearance has changed often, and in significant ways. This picture is what it looks like right now. Notice how far the trees have grown, and how the ground has dried out. Due to the rarity of rainfalls, it doesn't stay green during droughts. Obviously, Annkristin is more than just a visitor - she will help out as well. 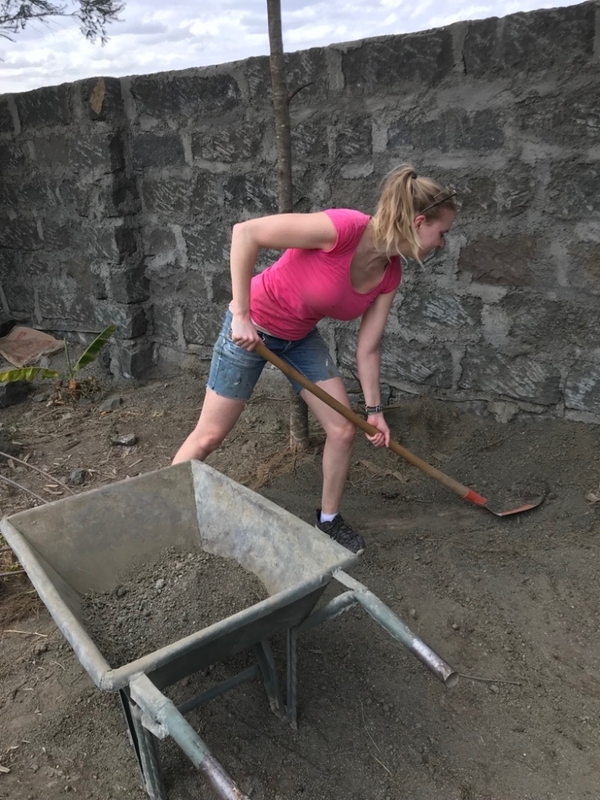 As you can see on the picture, she lent a hand in finalizing the construction of the wall, as well as clearing up the sand from the garden. Of course, she is also supporting in other areas, such as the household and the kitchen. 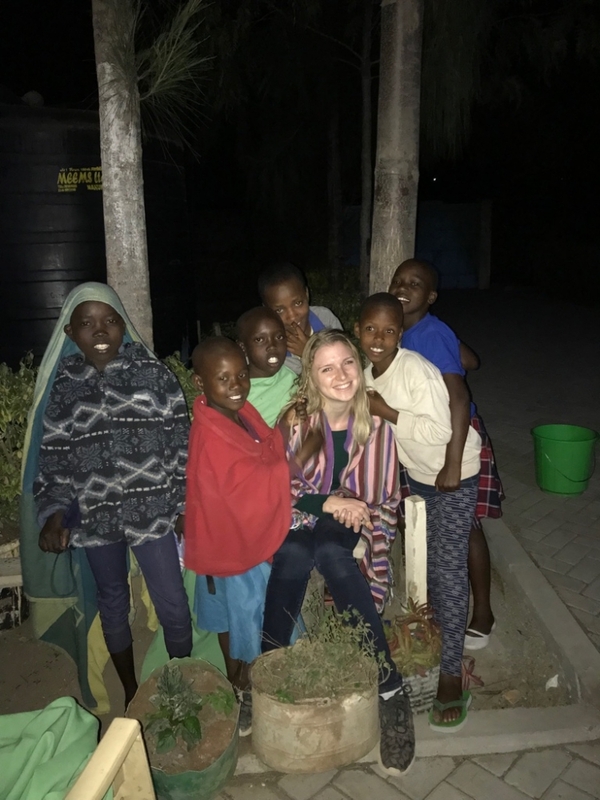 Annkristin, a member of our board, is currently travelling through Kenya, and will be staying at the Girls Center for several days. The girls are obviously delighted by her visit. We can't wait to reading her report once she returns. The courtyard has been tiled! The courtyard of the Center has now been fully tiled with stones. In the past, we often had the problem of water gathering after short downpours. Now, the water can flow between the stones and will no longer form massive puddles in the yard. 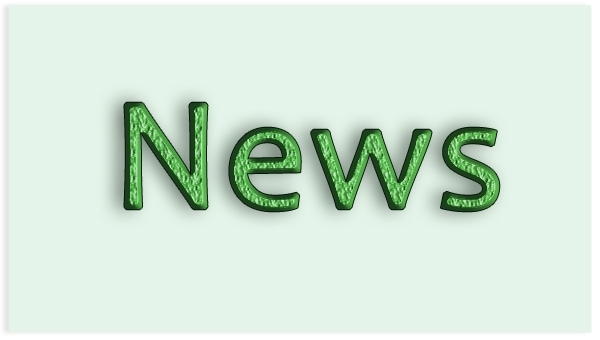 Time for the New Year's issue of our newsletter! As always, we have distributed the Home Care Express by mail. It is also available on this website in the "Downloads" category. We hope you enjoy the read and look forward to your input and comments - either here or per mail at newsletter@hcinternational.de . The winter travel group has returned to Germany safe and sound. Thank you all for your work and assistance on site. We look forward to seeing your reports and photographs! 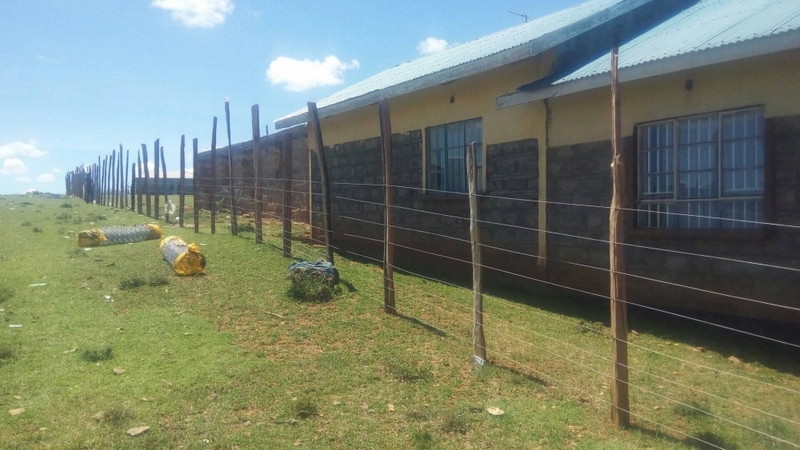 In particular, our group, supported by many of our Kenyan friends, spent several days in Morijo Loita Hills, where they built a stable, solid fence around the Health Center. We would like to take this opportunity to thank the Protestant community at Hirzenhain, whose donations enabled the construction work. 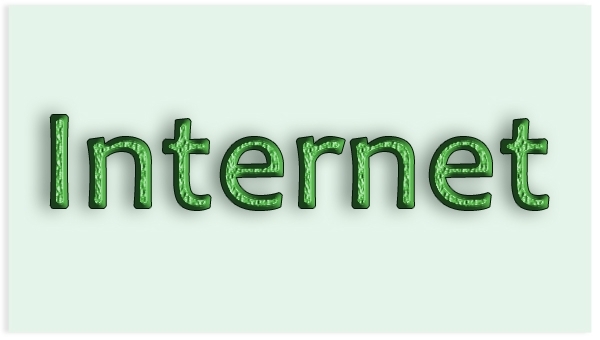 The Internet platform www.gooding.de allows anyone to support our charity through your online shopping at no additional cost. This includes more than 1.000 online shops, such as eBay, HRS, DBahn and Zalando. For every purchase, our charity receives a percentage of 5% on average. This is paid by the company and does not cost you anything extra. Gooding pays for itself via a voluntary part of the donation. There is no need to register and/or provide any personal data. We would be more than grateful if you use Gooding for your next purchase and select our charity! 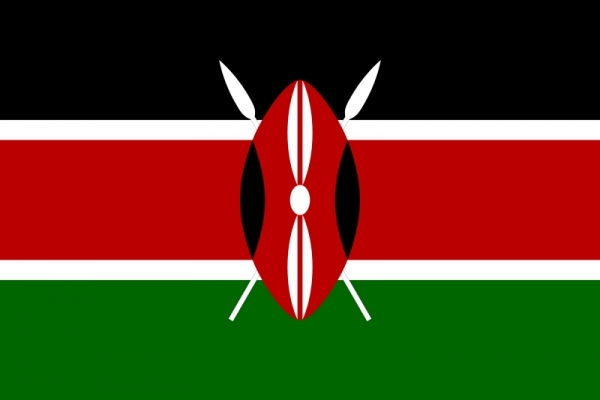 A small group of three people will be travellind to Kenya within the next few days. We wish them a safe flight and a good time on site. Their main task will be the construction of a fence around the Morijo Health Center. 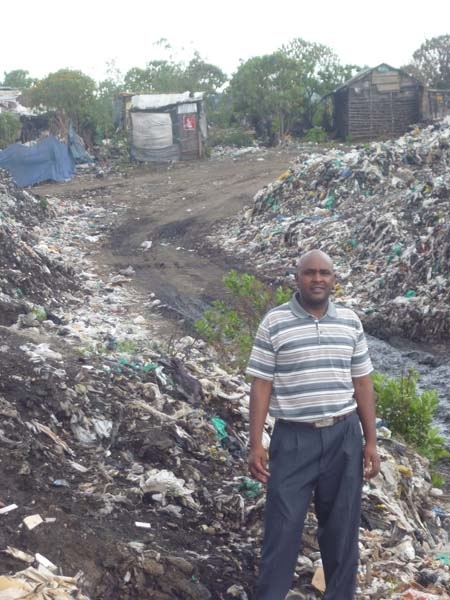 A Kenyan team of eleven volunteers will assist them in doing so. Thank you all for your support! 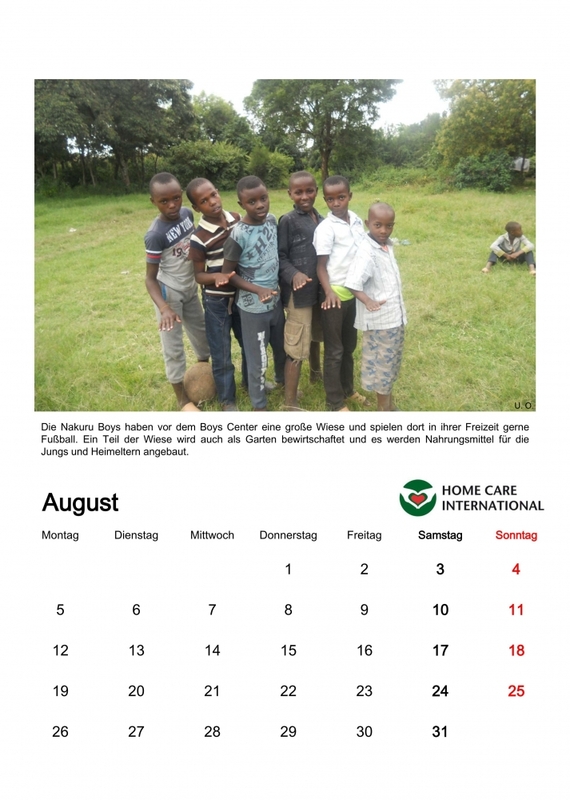 The calendar is now finished and can be ordered at kalender@hcinternational.de . Alternatively, you can also buy them from any of our board members. Once again, there will be a new Home Care Calendar next year! It is almost complete and will be printed during the next few days. 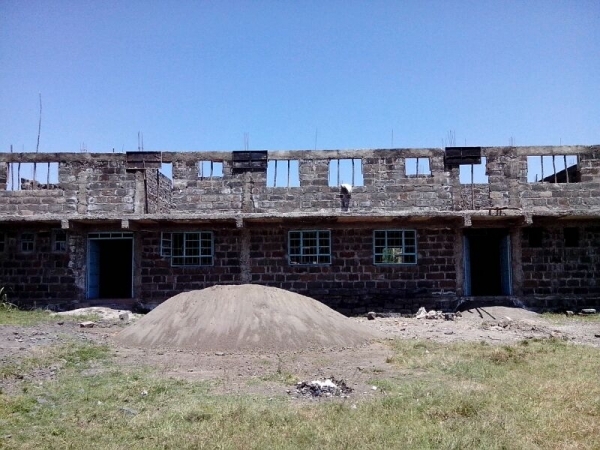 We will be giving you a look at lots of projects, as well as our scholarship children and life in Kenya. If you were still looking for a birthday or Christmas present, you might have just found one! Thank you to everyone from Hirzenhain, as well as all our guests, for this wonderful day. After a great church service with lots of children, guitar music, pictures and singing, we enjoyed lunch together. There, we met a lot of interested people and were able to answer questions. In particular, we would like to thank the Brück family for organizing the event. 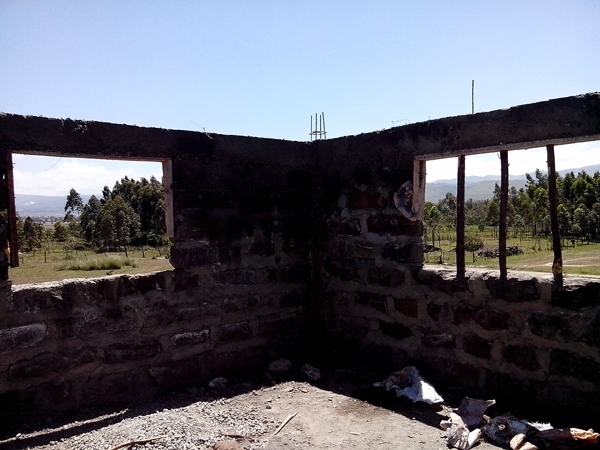 A lot has happened in our projects in Kenya. You can read about the improvements, the visits and lots of other news in our newsletter. 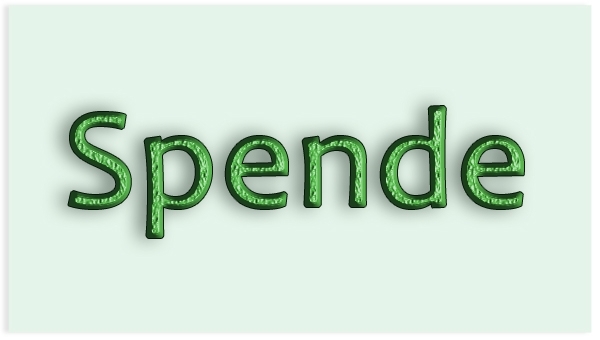 Once again, we have published the Home Care Express by e-mail. It can also be accessed on our website under "Downloads". We hope you enjoy reading and look forward to hearing your feedback - either here in the comment section or at newsletter@hcinternational.de. 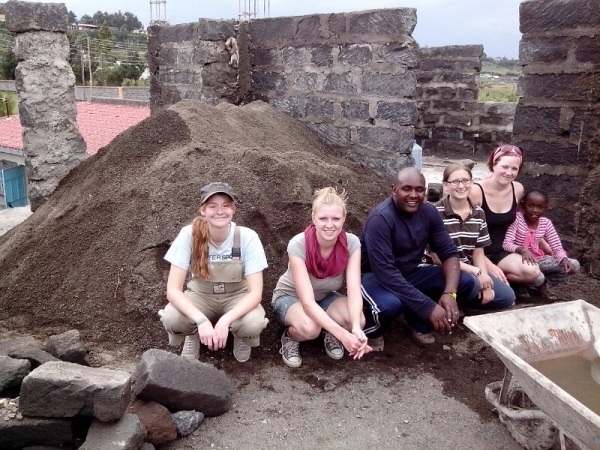 After five weeks in Kenya, our three interns Esther, Lejla and Ulli have come home. Thank you for your efforts, your jokes and the delicious Mandazi you baked for and with the local children. We now have lights both above the staircase and in the top floor. In addition, the shower in the bathroom has been completed. The only part missing is a light in the bathroom. Our Summer group is back in Germany! With lots of dust in their suitcases, lots of pictures on their camera cards, new friends and huge smiles, the travel group returned home this week. The past three weeks were very intense, with lots of work, fun and action. On the picture, you can see the visit to the Boys Center. The time may have been short, but the football game in particular was more than memorable. Thank you for your great efforts! The rear gate has a new coat of paint! The travel group and our interns worked together to deliver two fresh layers of paint. Thank you very much for your help! 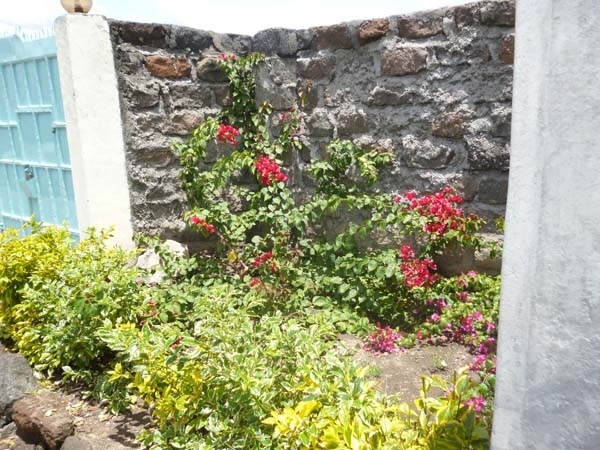 In July and August, a wall was built around the Girls Center garden. The old fence has been stripped down and moved to another garden patch. 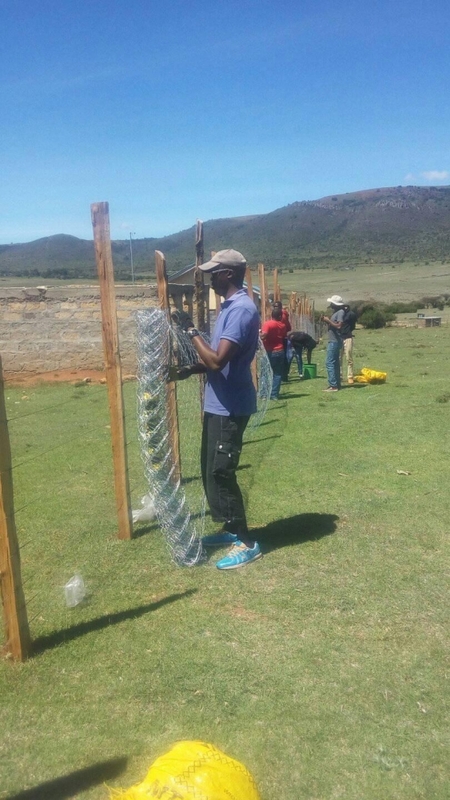 The wall will insure both security and protection against animals, such as the wild dogs living in the area. 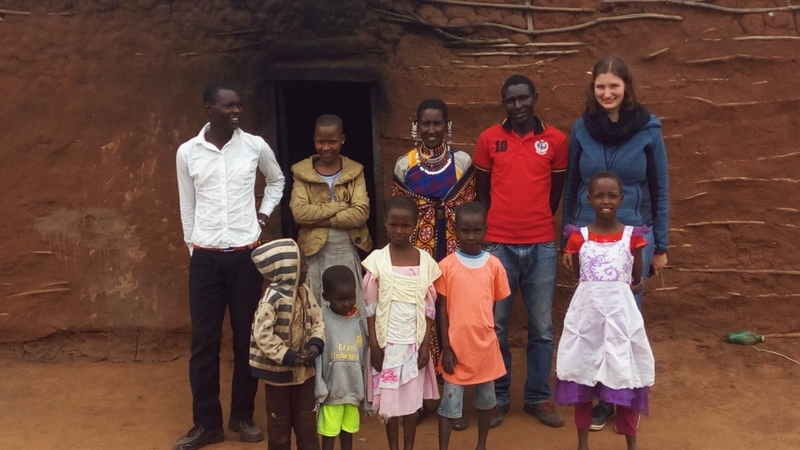 After the summer trip, Kerstin will be staying in Kenya for an additional four weeks. 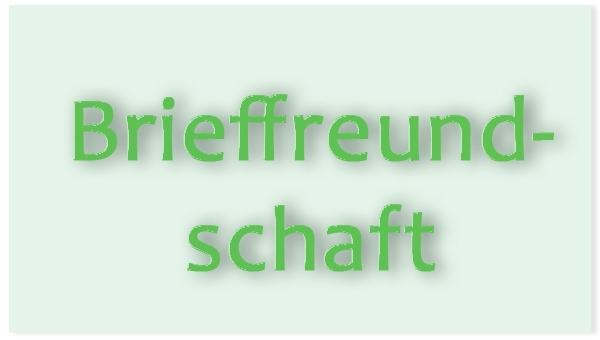 In addition, three interns from Bochum will join her. We wish you all a pleasant and eventful time on site. Summer Trip 2018- Here we go! It's time: tomorrow, the Summer Group will be leaving for Kenya. We wish you lots of energy, great experiences, beautiful sunsets and lots of interesting talks. We look forward to hearing what they encountered and seeing their impressions in their pictures. Of course, we will be reporting on them in the next HCI Express! One of our interns, Esther, will be joining the group in Kenya. If you are interested, please let us know at info@hcinternational.de! We look forward to travelling with old and new acquaintances, and we appreciate anyone joining us. 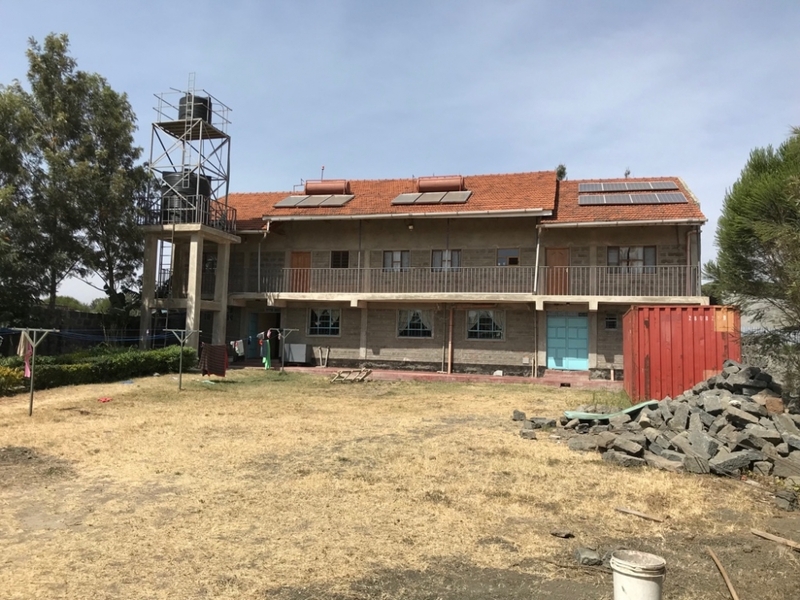 Due to the ongoing drought in and around Nakuru we had the idea about investing in a well for the center and for all the people around like from Kiungururia. The Rotary Club Bad Homburg will support this project. Its water would not only relieve the situation for our girls, but would support the entire community and create independancy from high local water prices and insufficient public water supply. The way to success is still a long one, but we are currently making plans as fast as possible! The first travelers have started their journey to Kenya today. 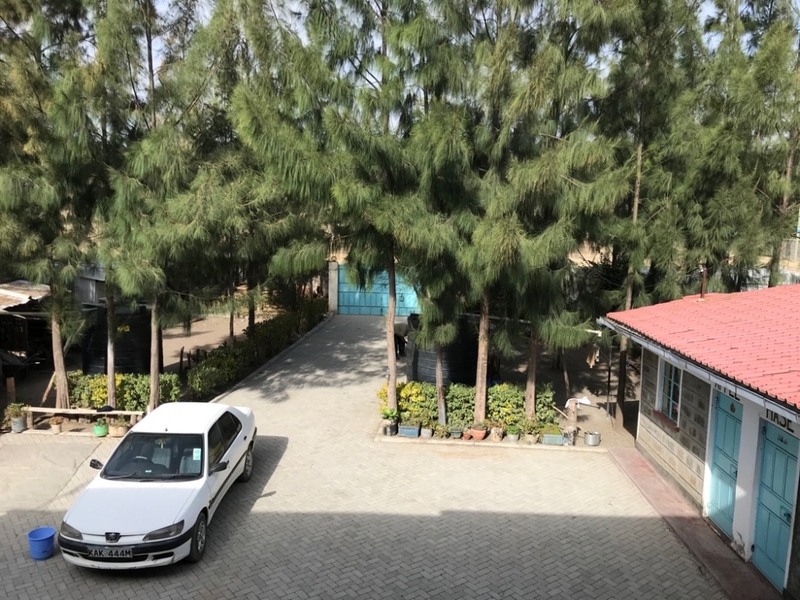 They will be followed by several others in the coming days, while those already arrived can enjoy the sun and good food at the Home Care Center. We hope you all have a wonderful journey and we will be excited to hear about your experiences when you get back! 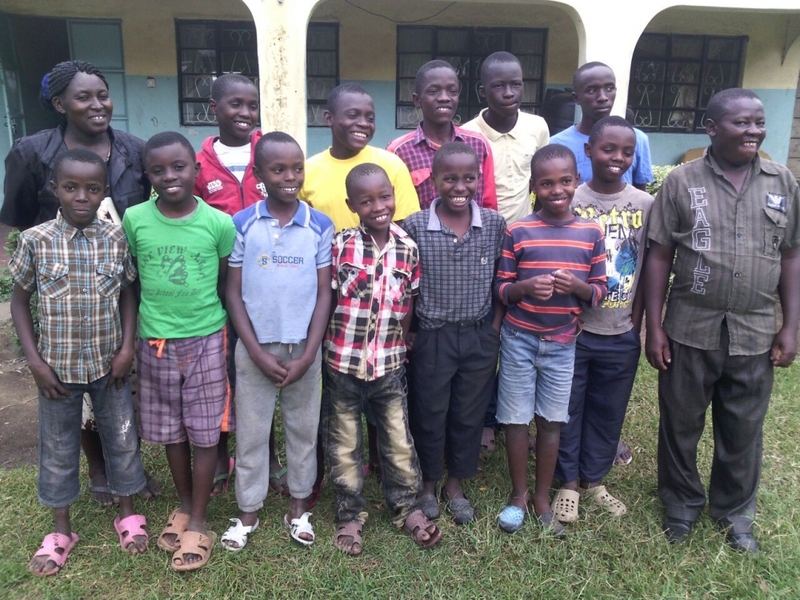 We are proud to announce a new project: The "Nakuru Boys", an initiative directed at street children in Bondeni/Nakuru. 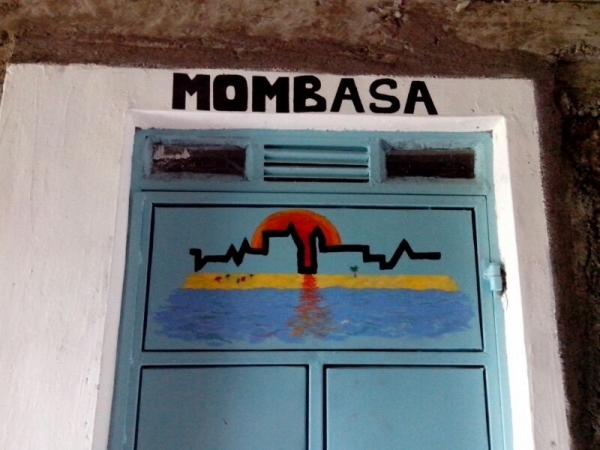 The boys in this project have all been living in the nearby slums and are looked after in a center of there own. Just like our girls in the Home Care Center, the boys are provided with the necessary food and medical treatments, enabling them to attend and succeed in school. We look forward to their progress! ...to Ann Muthoni and Purity Mukami who will be sitting for their final secondary school exam this year, and Emily Nanare who will be taking her final exam in primary level. Best wishes from everyone for those challenges! We are very happy and grateful to announce that Jennifer has undergone surgical treatment for her eye. All seems to have gone well and Jennifer is recovering back at Nakuru Center with the other girls. Keep it up, Jennifer, and a good recovery until you meet the doctors again on August 22nd! Thank you to everyone who joined us last Saturday for our annual members´meeting in Bad Homburg! We had many lively discussions about Homecare´s current issues, while Kenyan chai and coffee kept us going... We hope to see you all again next year, the members´meeting will take place on the 23rd of June 2018. Your ideas, questions, commitment and the delicious cakes were very much appreciated! 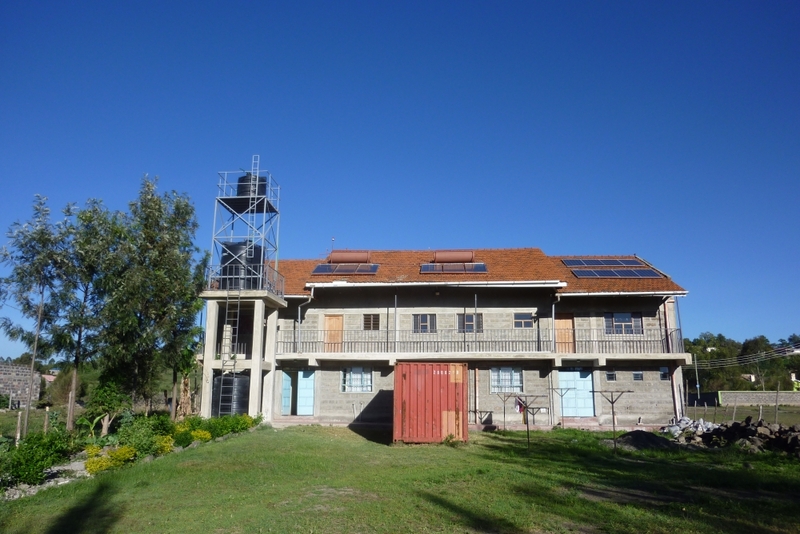 Hot water is now being generated through two newly installed solar panels. 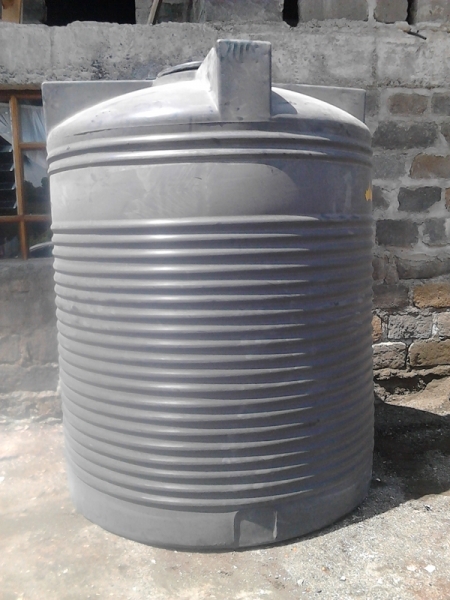 We also added an additional water tank to make use of the natural water pressure. We are excited to see how the system is going to work. Thanks again to the sponsor and for setting an example toward sustainability and renewable energies. First solar cells were installed at the centre and large batteries were bought for storage. Now the systems especially for lights still have to be changed to 12 volt. 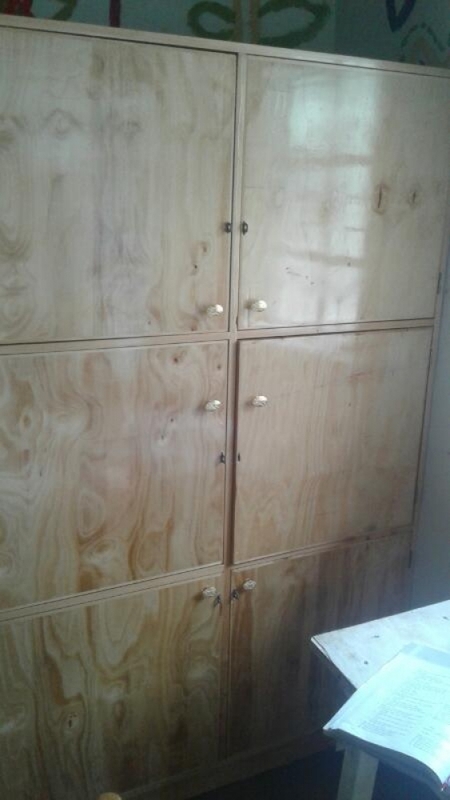 Carpenters have come back to the Home Care Center and made six new beautiful wooden cupboards. Later they want to add different types of cupboards, tables and maybe also book shelves. Activities for Home Care Int. 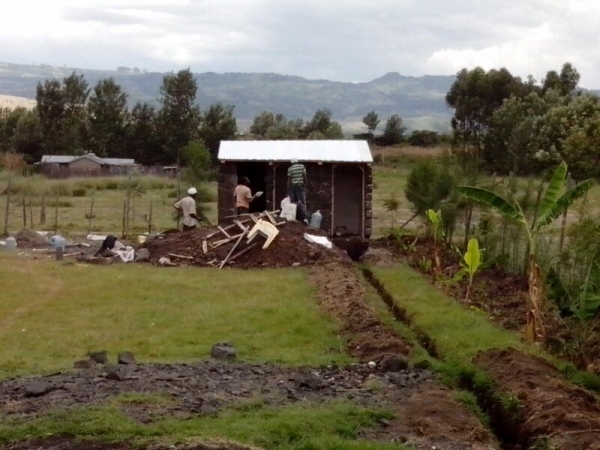 The construction of the house in Morijo is going on well. From now on only minor works, a roof gutter and a fence is needed. We are still looking for sponsors to buy a water tank. Since rain has finally started, it can then be collected and water does not need to be fetched from a source which is 2-3 km away. Tiles have been put on the first floor. After windows and doors, we still need to paint the walls and can then start to make ourselves comfortable up there. After having bought 15 goats through fruit tree last year, the first ones have now given birth to babies. When they are big enough we are going to give them out to different families. A neighbour to the centre in Kenya donated a lot of firewood for cooking. Furthermore, the foundation for the big water tank has been renewed. After a long period without rain the tanks were empty and we are planning to put a cistern in the garden with a generous donation to get through the dry weeks without many issues. 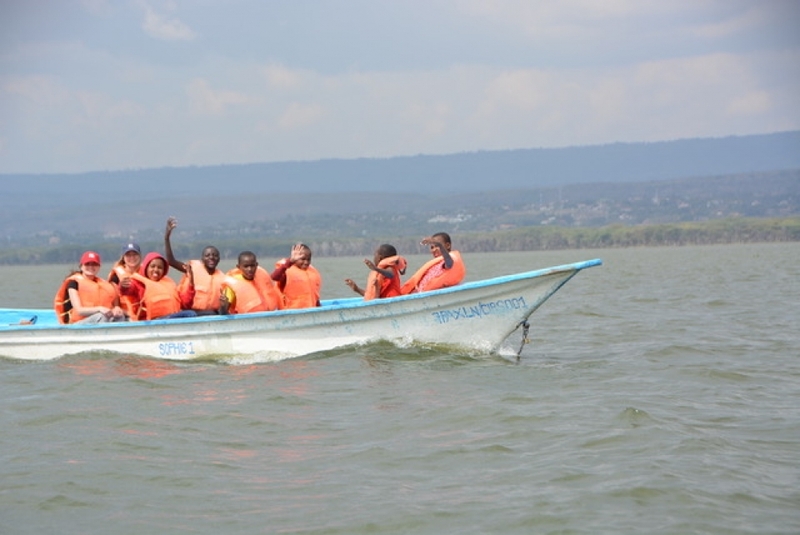 On Saturday, the 4th of March, our Home Care girls went on an excursion to Naivasha. 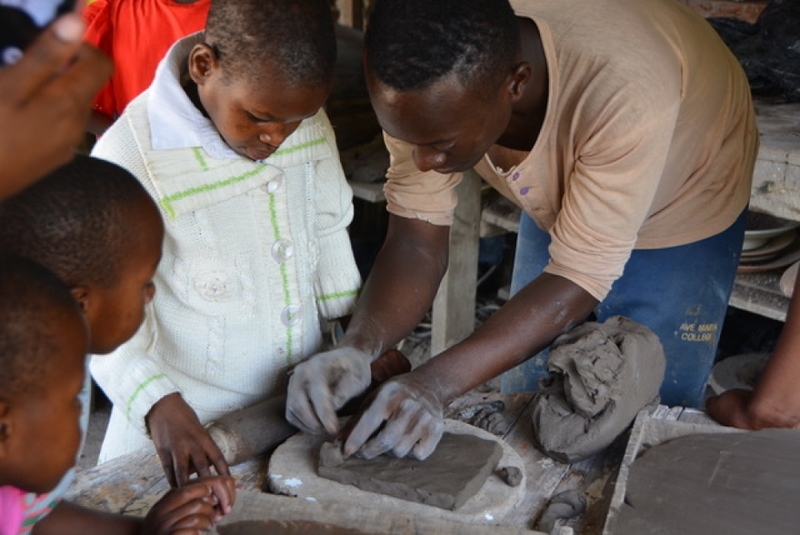 The first stop was „Fired Earth Pottery Naivasha“. They make beautiful cutlery, vases, tiles and more. Here each girl was allowed to do a cup, a plate or a bowle with the pottery machine. Additionally, the girls could form some cutlery by hand from clay. They had a lot of fun because it was something new for all of them. 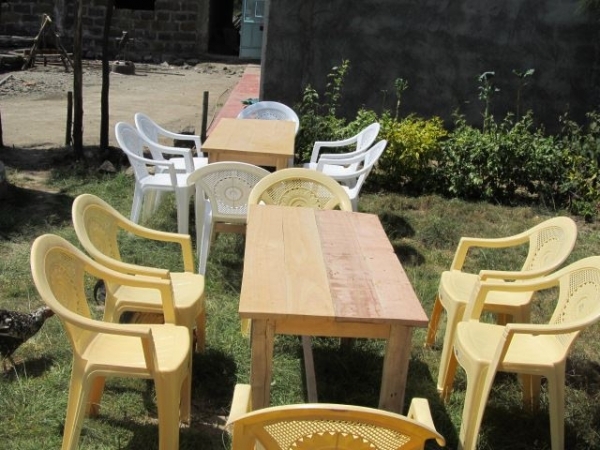 After being painted and burnt the things will be send to Nakuru to be put to use. Followed by a lunch break, the girls later went to explore the lake on a boat which was also new and adventurous for them. We saw hippos and a large variety of birds. In the evening everyone arrived back home at the centre and they ended the excursion with some German pudding porridge. All team members in Kenya met on the 12th of March in Bogoria. 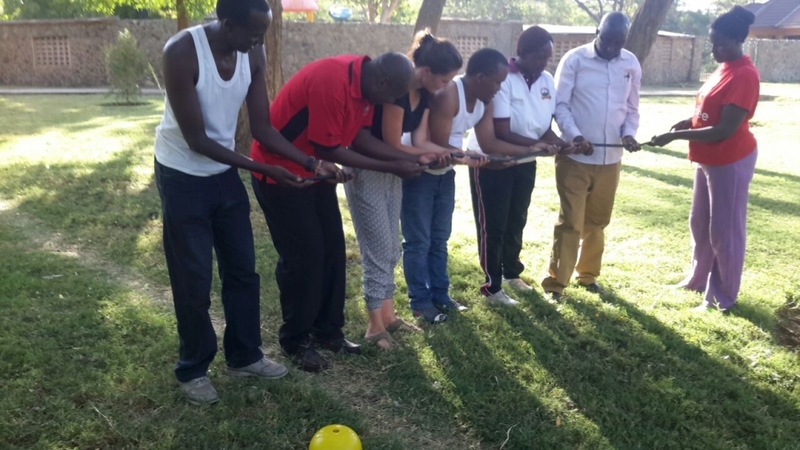 Apart from good food, team building games, a sense of community, getting to know each other and exchange, a lot of topics have been talked about, tasks were addressed and distributed and future directions of Home Care Kenya were discussed. For many it was the first time to have such a meeting and even in Germany we felt it was a good thing that helped to gain strength for the future work. Thanks to our host and all team members. 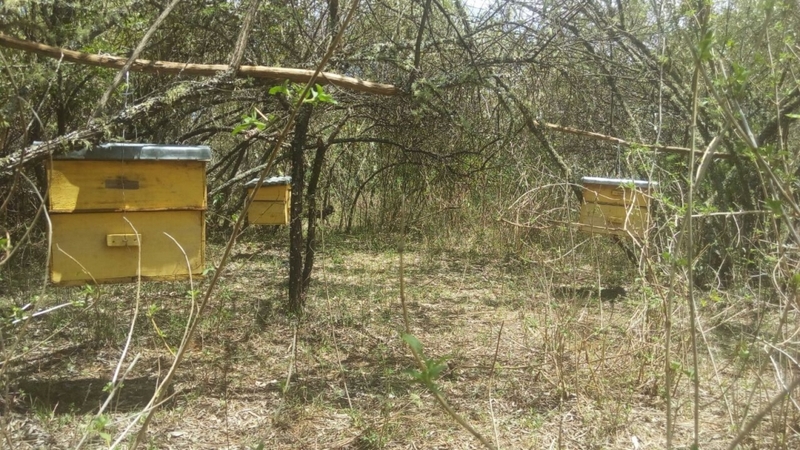 All beehives have now been put up in their spots in the forest. Due to drought it is currently a bit difficult to get bees and honey. We hope that it is going to rain soon so that blossoms can start and bring honey to the community. We still want to buy a protective suit for Loita Hills. If anyone still has utensils for beekeeping to give away, we will be happy to take it to Kenya in summer. Five new girls from Suswa have found a second home in the centre. They feel comfortable and bring new joy and enrichment to the others. 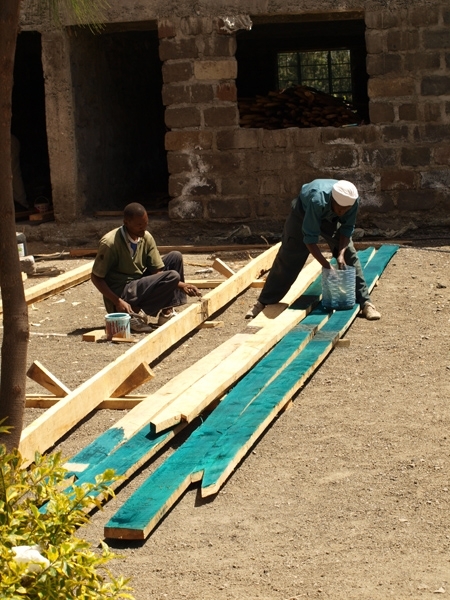 Some carpenters from Nairobi and Nakuru have started to replace the older beds made from steel with wooden beds. Step by step all rooms shall have wooden double and single beds. All girls have moreover received new and thicker mattresses. 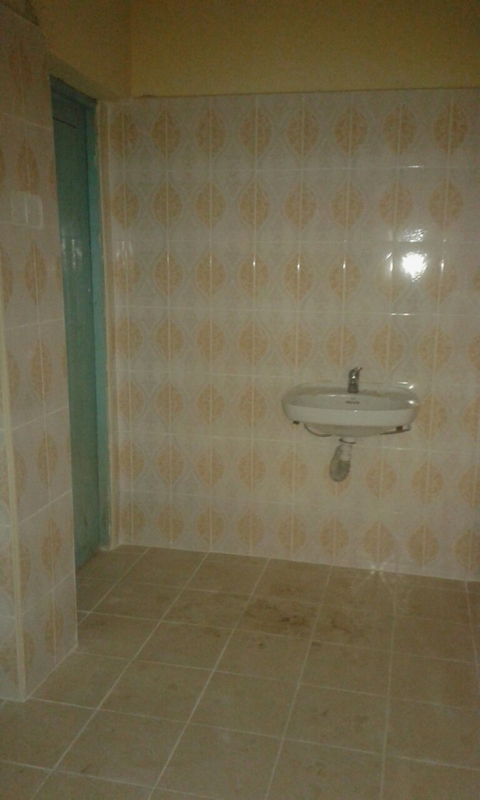 Visitors are also going to have guest rooms with shower and toilet. So far we are still looking for donations for the rest of the beds. After major construction work was completed, workers and the family started to put clay on the walls and to make the interior look nice. Amazing how fast a house can be built when people join their hands together. We are excited to see how it is going to look like when it is done and what Jennifer's family is going to say about it. The team of HCI would like to thank all sponsors, active members, supporters and prayers and everyone connected to HCI for 2016. You make the world for many children a better and better place. A lot is again planned for 2017 for which we need your ongoing support without which the progress would not be possible. We wish everyone a healthy and vigorous new year 2017 with many blessings. The first part of the new house for Jennifer N.'s family is done. The scaffolding and the roof are complete. Thanks to all donors and the many helping hands. Christmas season has arrived since long and the yearly search for gifts has started. Are you also still looking for a perfect Christmas present for your loved ones? What is most important that we should not forget is: ideas and time. One idea we could also suggest for you: Christmas is always a good occasion to help kids in need. For our girls center in Nakuru, Kenya we would like to buy 10 double wooden beds and 10 normal wooden beds. One double costs around 110 Euros while a normal one costs around 50 Euros. We will be very happy if you like to give a new bed to the kids. You can easily donate via: »Bankverbindung« At will you receive pictures and a donation receipt (Donation receipts for donations above 10 Euros can only be send out starting from 2017). We thank you in the name of the children for your support and wish you a blessed Christmas period and a healthy start in 2017. In all bathrooms, toilets and washing rooms of the first floor there is fluxion now. The kids will be happy J For the second floor bathrooms and toilets are still being finished currently. First books have been bought by donations for setting up the Home Care International Center library. 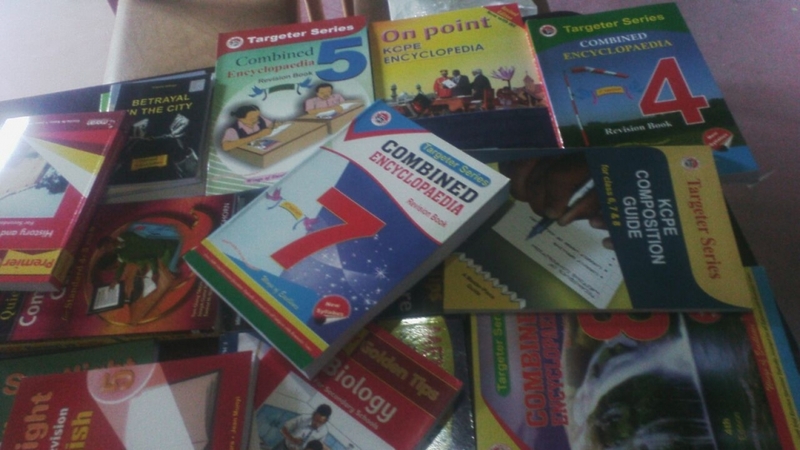 Among them are study books, lexica and books for special trainings. We are hoping that the library will keep growing and growing. It would be great to also find someone to sponsor a bookshelf that can be constructed by a local carpenter. Some children in the Home Care International Center learn how to nit pieces of cloths together with a sewing machine that was brought to Kenya last year. The width of material is turning nicely into dresses, pillows or other stuff. Thanks to James’ sister for helping the girls to become more independent. Dear friends! If you are looking for a nice Christmas gift, we have something for you! We created a calendar for next year with beautiful pictures from Kenya. It will be available at several events in exchange for donations (around 10 Euros). Furthermore, you can get one or more calendars from James Karanja. Just write us an email. 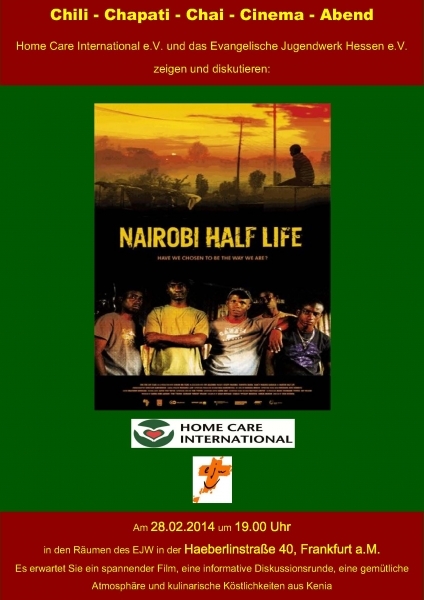 All donations will benefit the work and projects of Home Care International e.V.! Pupils in Kenya will now be on holiday for 6-8 weeks depending on the grade they are in. 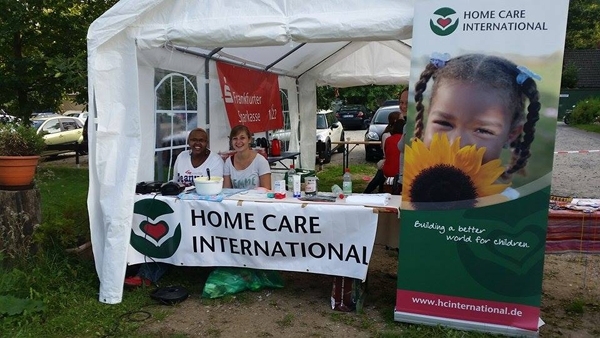 A supporter of Home Care International raised 180 Euros in course of a service anniversary. Thanks for that! 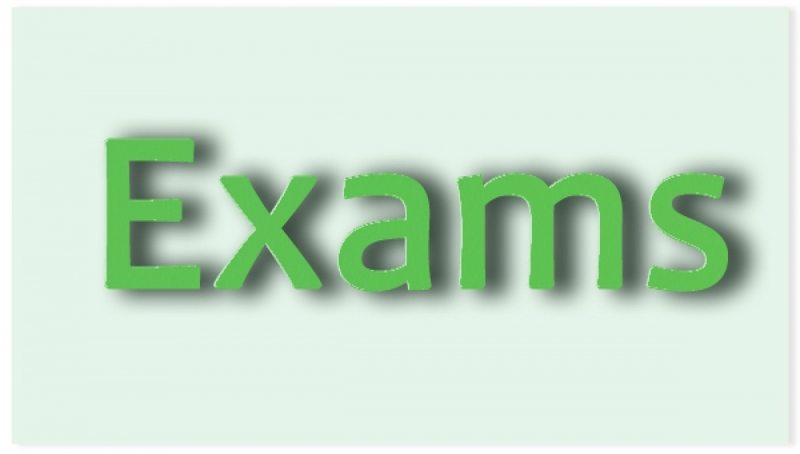 Ann and Lucy are going to take the exams for the Kenya certificate secondary education (KCSE) on November 4th. Dorcas and Ann are going their Kenya certificate of primary education (KCPE) on November 3rd. All of them are preparing intensively during the next weeks. We wish them a lot of strength, blessings, and success. Public schools furthermore intend to close on the 28th of October and private schools a day before. Some bees have already moved into the new bee hives. We are excited and waiting for the first glasses of honey and for more bees to come to the region of Morijo. During a special pedagogy day, a school near Marburg collected 100 euros by selling cake that they donated to Home Care International. Thanks to everyone who baked a cake and supported us with their donations. 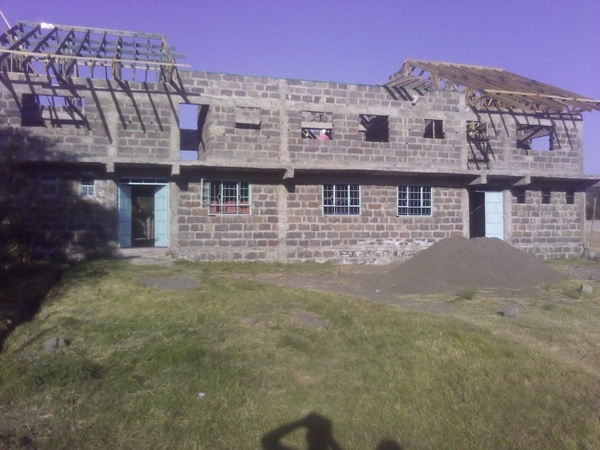 We will use the money to buy new books for the center in Nakuru. Hi to all readers and friends. 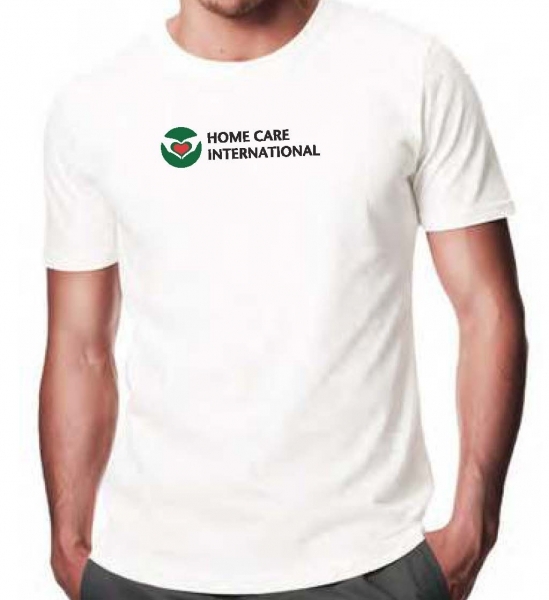 Do you have ideas how to start a fundraising event for Home Care International? Or do you feel like you would like to organize something on a christmas market, a birthday party, a concert or a similar event? If yes, take action and let us know how we can support you in this! Just write us on: info@hcinternational.de Thank you! Since the harvest was that good, we sold some of the vegetables that we would like to be able to store in the future. 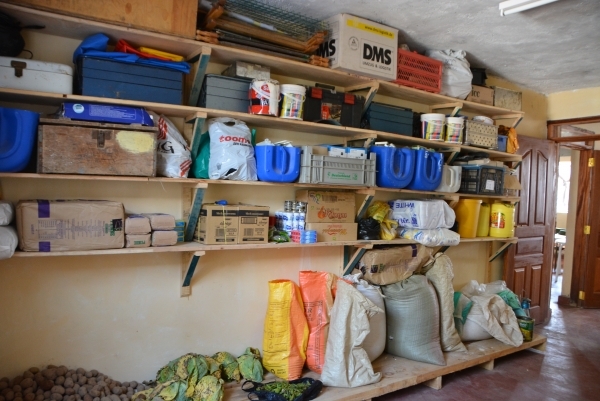 Therefore, we are looking for donations to build a storage room for all products that are being harvested. 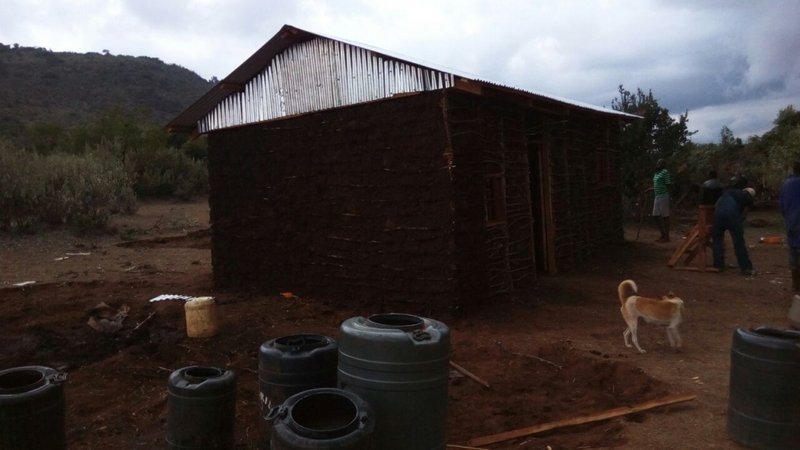 After the visit to Loita Hills the idea came up to support a family there in building a new house that gives shelter against wild animals. 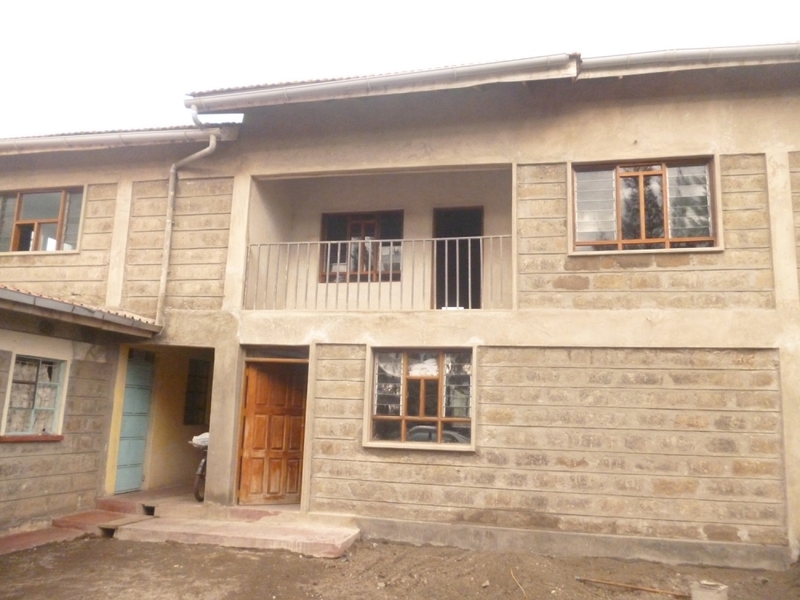 One child of the family lives in the center in Nakuru. The mother has been living alone with the other children for several years in a small and smoky hut without any windows. 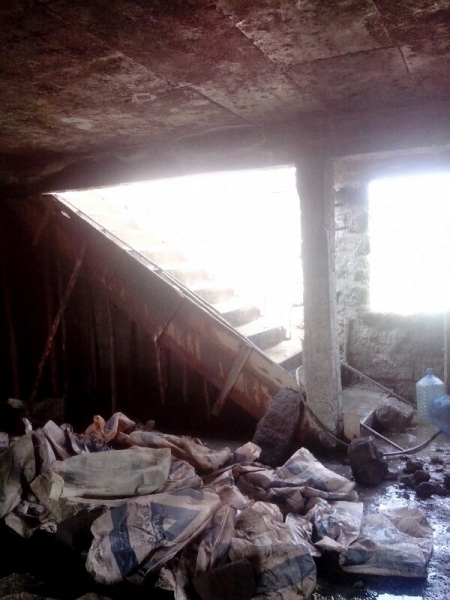 So far we have been collecting several hundred Euros, but we are still looking for further support in order to build the new home. 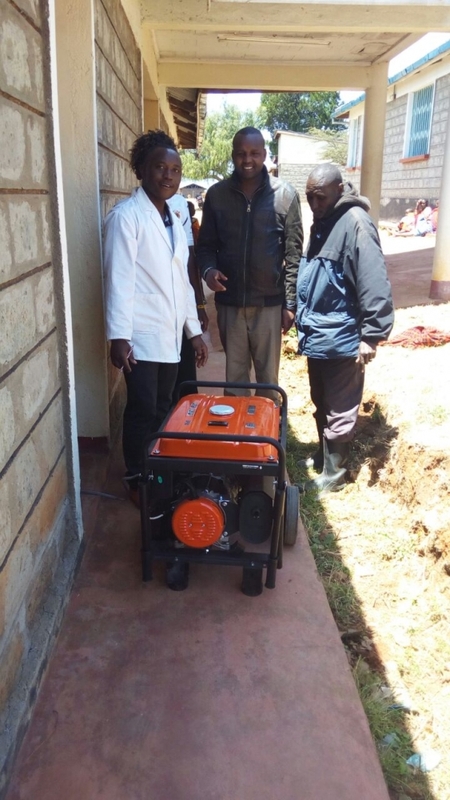 After a donation campaign of Home Care International for stable electricity supply in a hospital in Morijo enough money had been brought together to buy a big, but mobile generator. The local community also contributed a bit to raise the whole amount that was needed. Now the hospital can be supplied with electricity in cases of need. Before that some operations had to be done with torches. We hope that this will be a thing of the past. Yet, we still hope to find donors to provide a monthly contribution for running costs (petrol, reparation, maintenance, etc.) so that the generator can keep running. 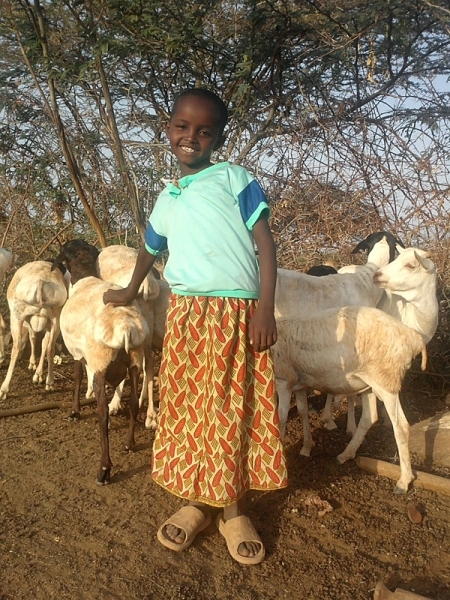 In cooperation with Fruit-Tree we were able to buy several goats for a number of families. The goats that give milk are very expensive in Kenya and were bought in Northern Kenya. 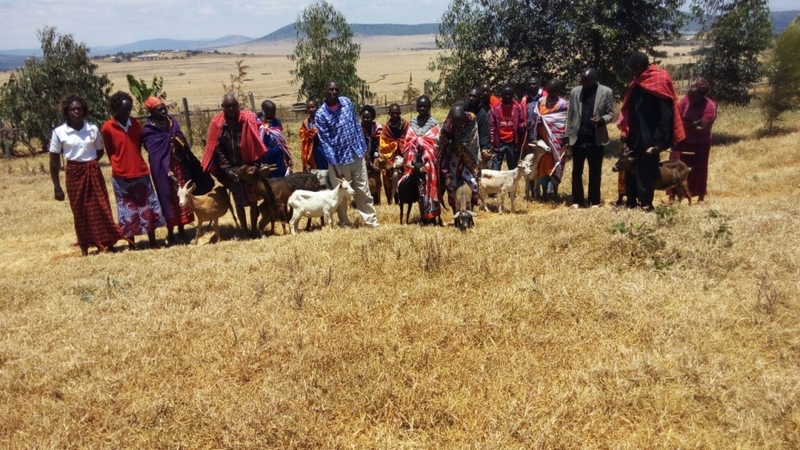 They were given out to families who are financially struggling like a form of microcredit to enable them to also support others by selling milk or later-on baby goats. This can be a step towards self-employment and financial stability by ensuring a basic income. We are looking forward to seeing how the goats are going to develop. 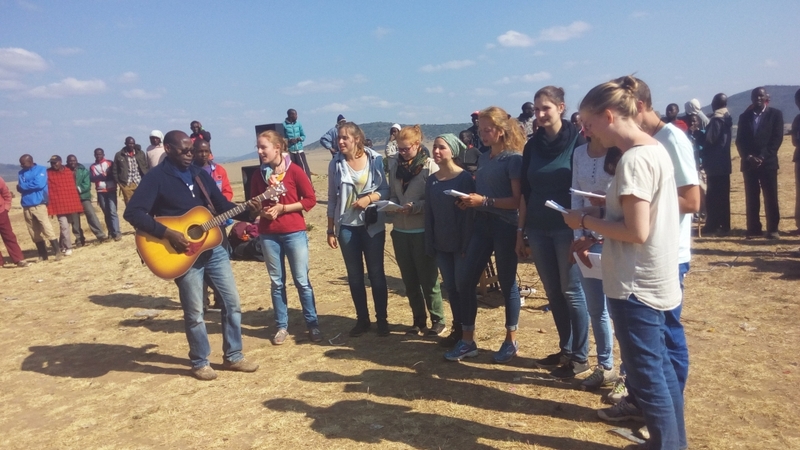 This year another group from the German Christian youth organisation EJW came to visit the projects in Kenya. 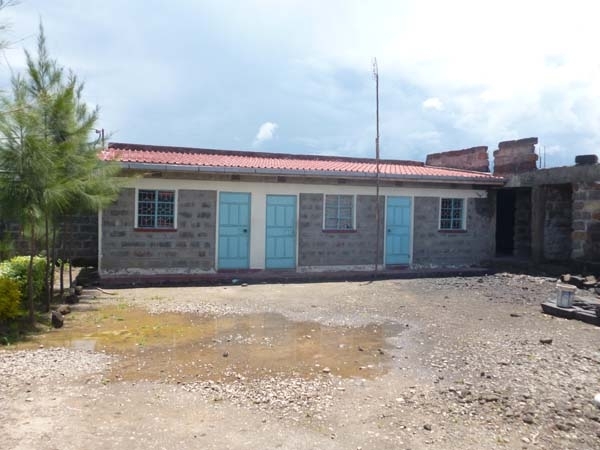 During their time, they worked at the center in Nakuru, visited several children, sang songs in different churches, saw many people and animals, went to Loita Hills and relaxed at the coast. 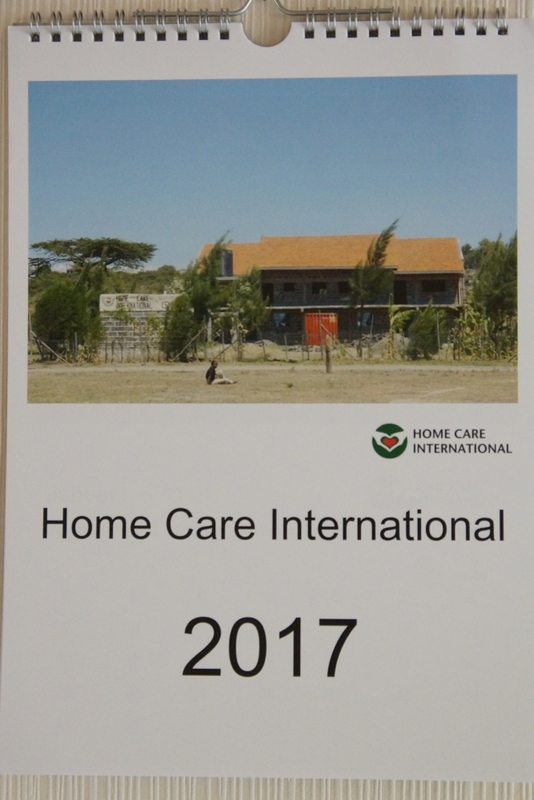 Thanks to all participants for the nice journey and their support to Home Care International and Home Care Kenya. 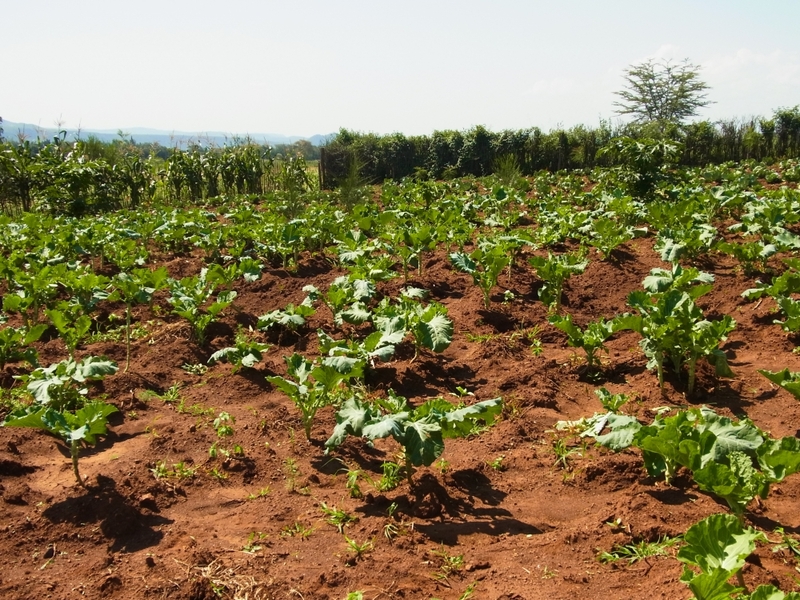 The second harvest on the plot in Solai was very good due to constant rain. A lot of maize, vegetables and fruits were harvested. The trees that had been planted in course of last year have grown much and are still growing more and more. We are furthermore happy to also have permanent water supply from a trough just in front of the plot. 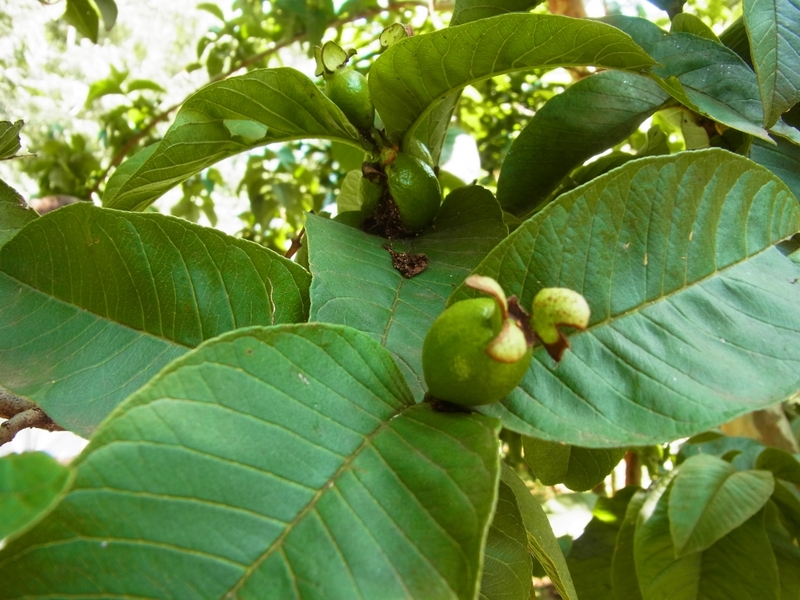 Most of the fruit trees resisted the initial period and are now growing fully. Pastor David is visiting Germany for three weeks, starting from this Monday. As a member of HCI Kenya he is going to have a look at what we do here, to meet friends, to hold theme nights, and to get to know the German way of life. During the first week he is going to be with Christian to learn about the school system, to visit the Hessentag and an institution for people with disabilities, and to paddle on a river in Fulda. Furthermore, we are going to talk about some projects in the region of Loita Hills where he comes from. Since the costs for his flight are not yet fully covered, we would also like to mention here that we highly appreciate support. 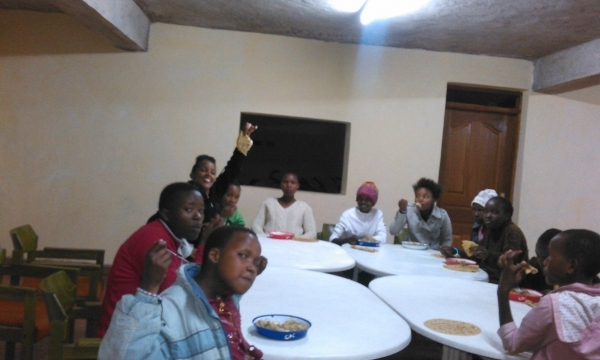 Every Friday young people from the Nakuru Life Point Church come to the centre to sing, pray, dance and talk with the girls. The girls are always looking forward to that and are enjoying the time with them. Tobi, who spend three weeks in Kenya assisting in the centre and in Solai, is going to report about his journey and experiences on the 1st of June. Everyone is warmly invited to come to the FeG Hartenrod-Schlierbach, Neuer Weg 5-6, 35080 Hartenrod at 7.30 p.m. The screed in the upper floor is now completed. In the room it was applied in red. In the living room and the kitchen we are having a simple one for now. Maybe we are going to have flow later. In the bathrooms the screed is also pretty much done. 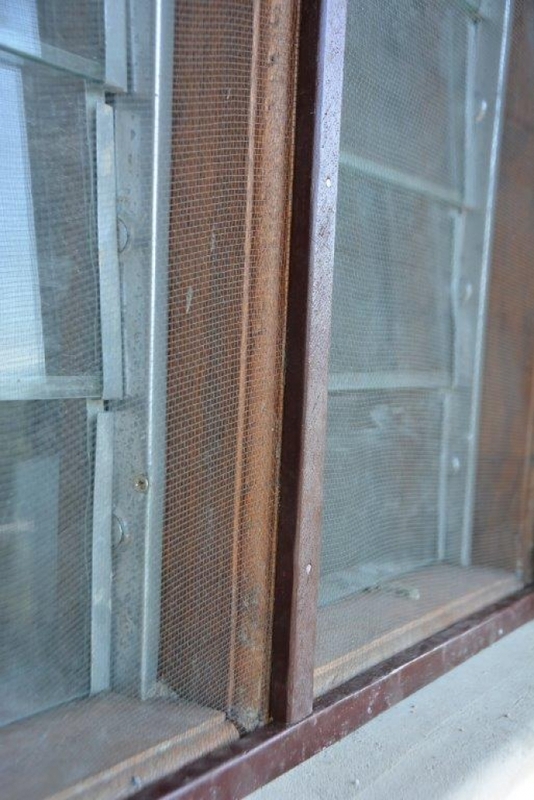 All windows were equipped with mosquito grids. 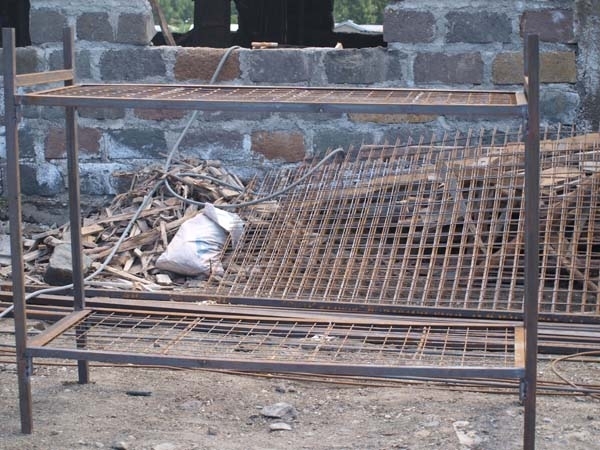 The grids are supposed to not only keep away mosquitoes, but also other insects in general. Within the last two weeks all exterior finish has been completed in the centre. Everything was plastered, window frames were set in, window panes were inserted. and also the water tower is wainscoted. 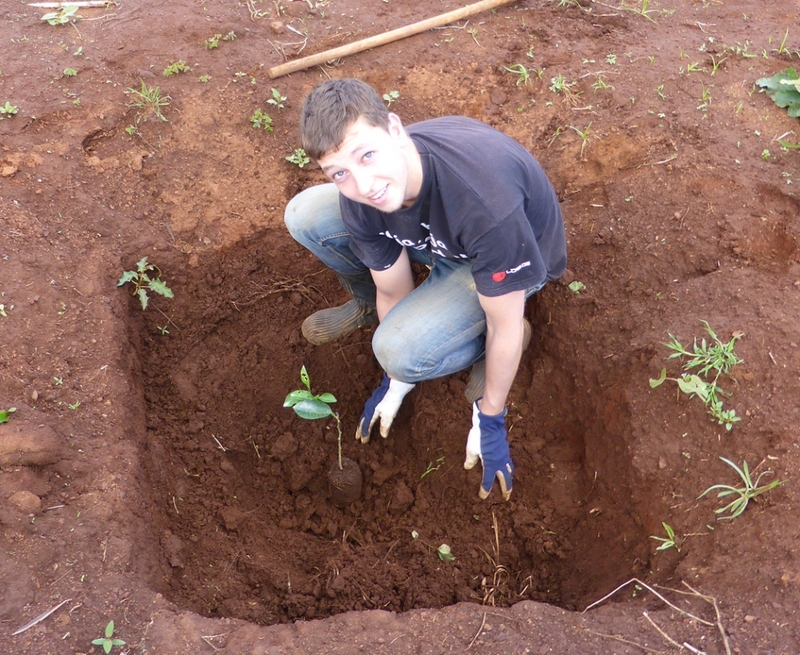 Tobi and Reuben planted more orange and mango trees on the plot in Solai. In order to do so, they drove to an arboretum near Lake Baringo. We are excited to see how fast the trees are going to grow, now that the climate is good and water is available. In some parts of Kenya, water still has to be fetched and carried home. How lucky we are that we can simply turn on the tap. 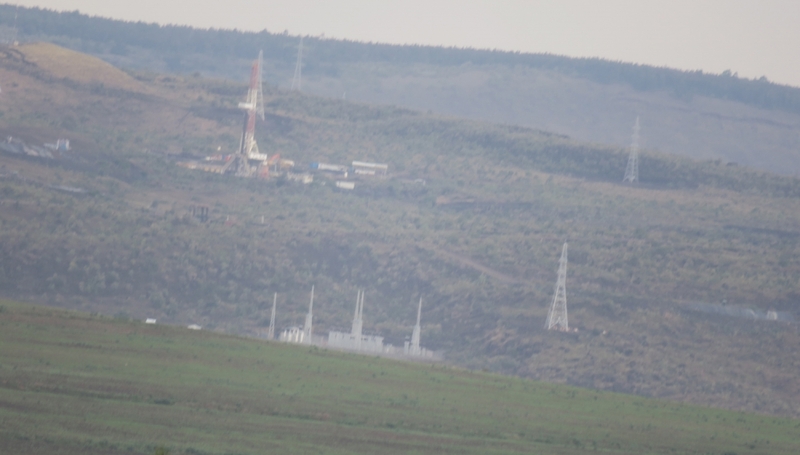 More and more geothermal power plants are being installed in the Menengai crater near Nakuru town. As a result, power supply in Nakuru is better compared to other regions. One can also see that more power lines are being built. 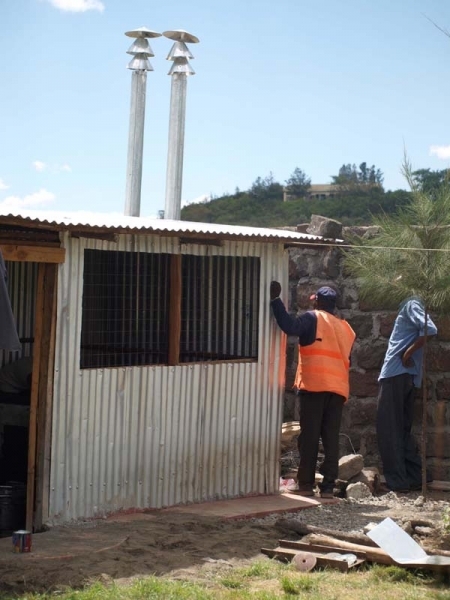 There are additional geothermal plants in Suswa that transfer hot water of the Rift Valley into power. Here you can see a picture of the center. It is still very dry in Nakuru, but when it starts raining, it will change soon. Some works have been done, and within the next two weeks, the center, the water tower, gangways and window frames will be rendered. When this is done, all the major works will finally be finished. After that we will start working on minor things and interior decoration step by step. Furthermore, some electrical adjustments were made. 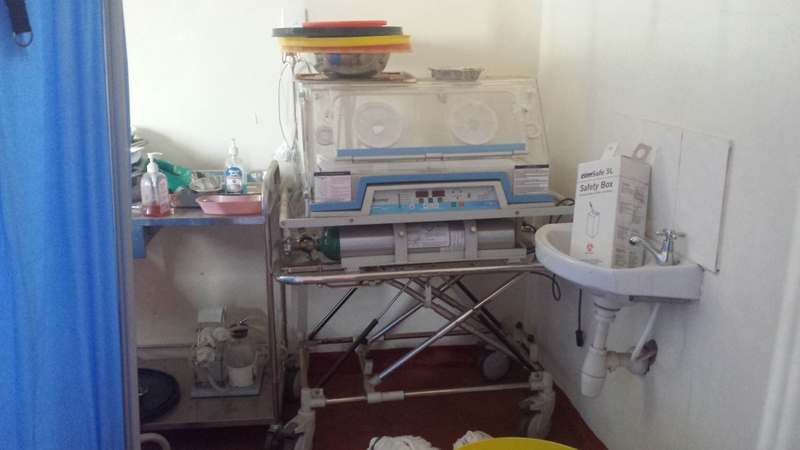 The hospital in Loita Hills is looking for donations to finance an emergency generator. Since there are power lines, but not always electricity, some operations in the evenings or at night have to be done with torches. Moreover, some children died during the last months, unfortunately, because the incubator does not work without electricity. Additionally, some medication cannot be cooled. There is a fridge, but again without power, nothing can work. Even microscopes can only be used during the day. 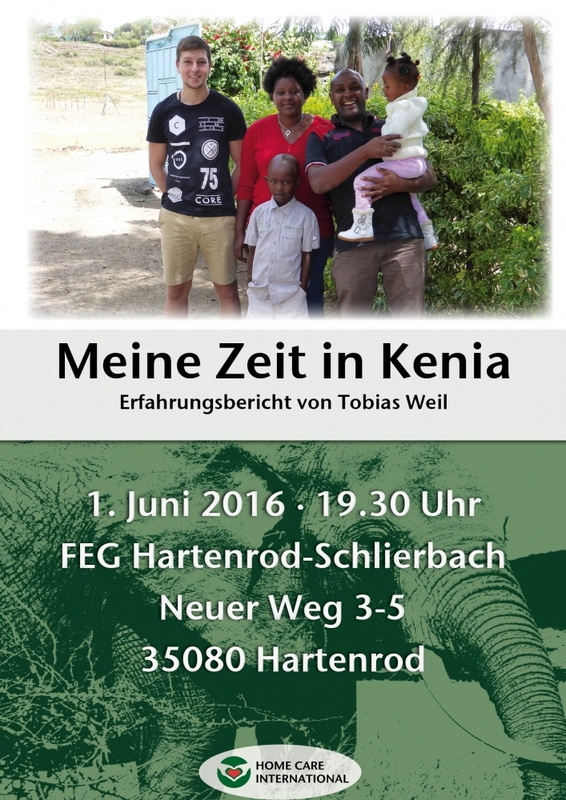 Tobi from Schlierbach is in Kenya for three weeks and will spend some time in the center to support us with several activities. He is also going to be in Solai for two days. We are excited to hear what he will have to tell. The Board (Team Kenya) met at the center yesterday. They talked about a lot of things until late in the evening and took several decisions. A school director from Thika also joined as a member and attended for the first time. More information will follow. 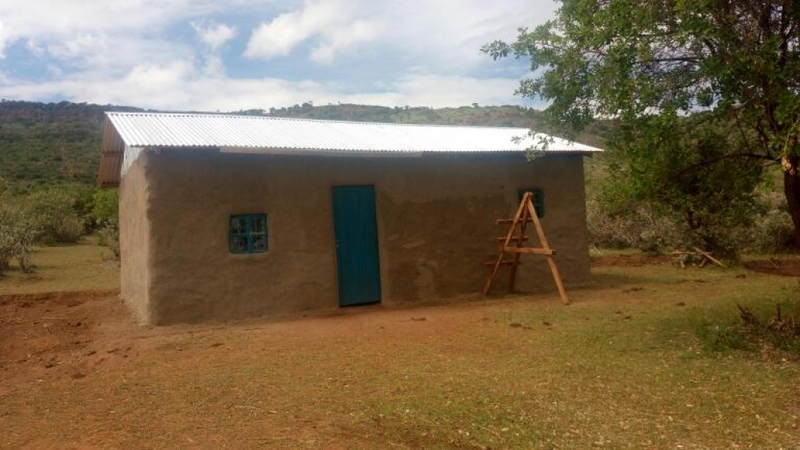 Under the leadership of Pastor Richard Nkomea the community of the church in Suswa continues to grow. Three years ago the service still took place under a tree. Today, they have a nice building for the church. We had the chance to take part in a service and to send greetings to all our friends in Germany. 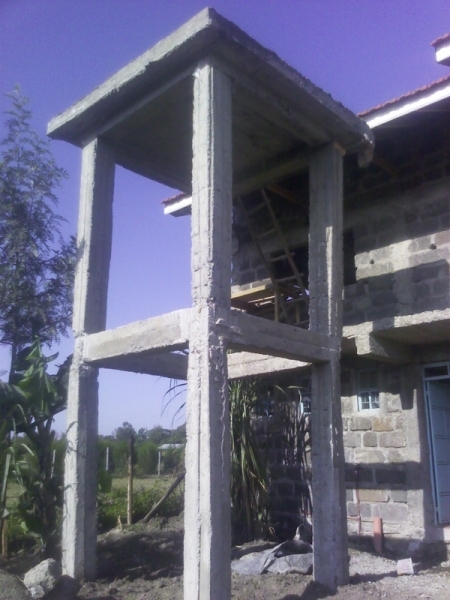 The well that was partly financed by Home Care International e.V. is fully functioning all year around and can also be used as a water place for animals. 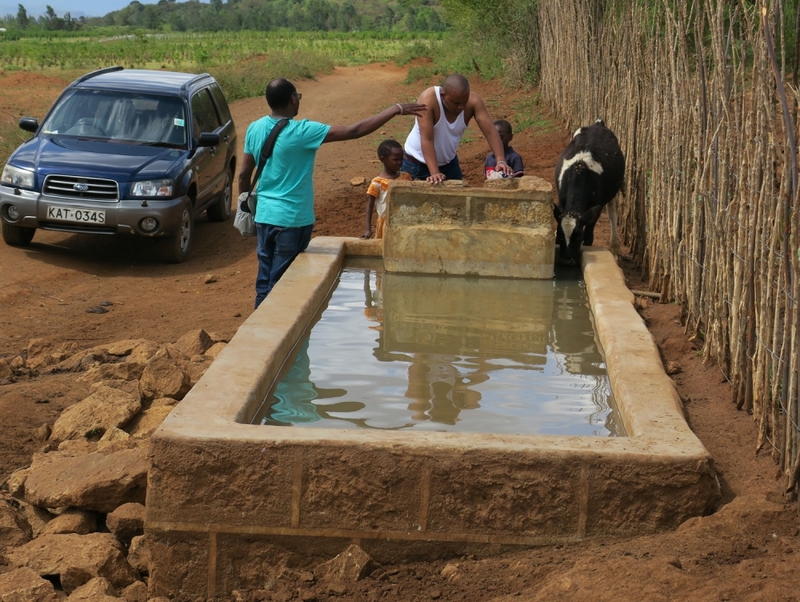 Many people nearby use the well for their cattle or privately for washing and drinking. Some people that come there to fetch water even stay 5-10 km away. This way the well is a good contribution to the supply of the community. Furthermore, we can now water the neighbouring plot of Home Care International e.V. the whole year. Reuben will take care of that. Exterior work to render the center has started this week. With this hopefully all major works creating dust and dirt are going to be finished. After this we want to finish all rooms of the upper floor. 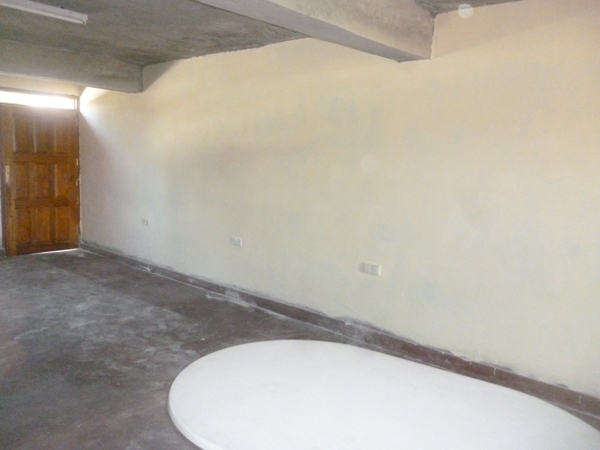 In addition, the ceilings of the rooms of the girls are going to be painted. The kids in the center finished taking their exams and are on holiday for three weeks. Three new girls have spend their first three months in the center and are looking forward to seeing their families again. These are Alice from Suswa, Emily from Mojito and Beatrice from Nairobi. Our stay is also ending on Friday when they close school. School will start again on the 2nd of May. Pastor James Khalbokha’s wife visited us in the center. She would like to see if her daughter could stay there. After we expressed our condolence again, we talked a lot about Korr and the work there. She would like to support us with what we do, and it was also not easy for her to get a long the last three months with the four kids. We wish her all the best and strength for the future, and will do our best to support her. 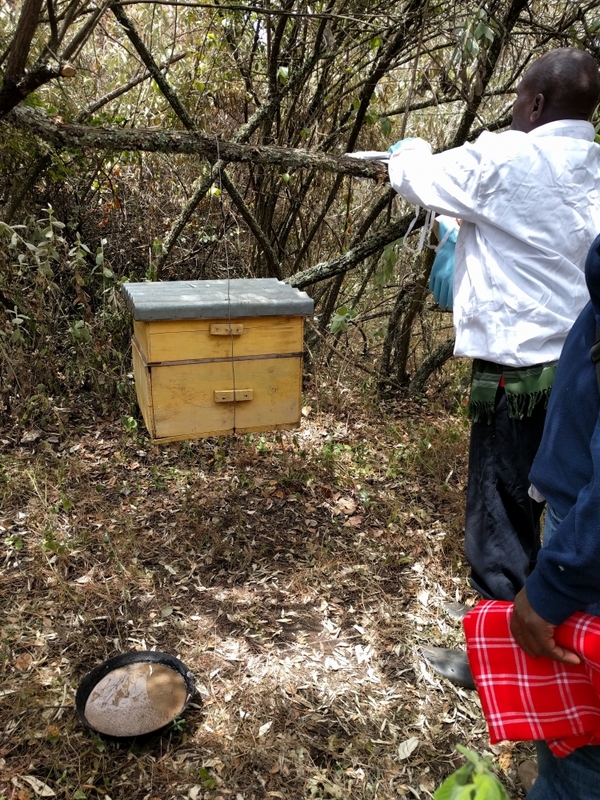 During our stay in Loita Hills, we visited a plot of a church where we would like to set up some beehives so that they can produce honey in the future. 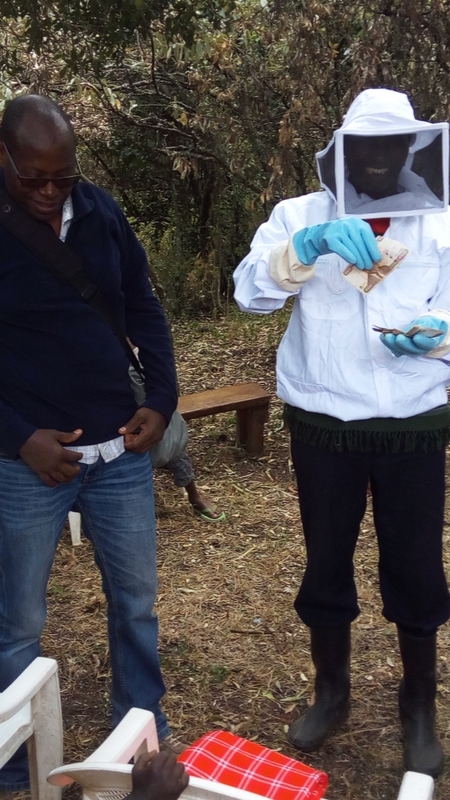 Apart from setting up the beehives, they will come up with a marketing structure. A plot, one beekeeper and a sling are already there. Who else is familiar with beekeeping? Please contact us ☺ If all goes well, maybe the center is also going to have its own honey one day. During our last visit in Mojito, which lies in the mountains of Loita hills, we went to see the hospital, the school, the parents of Emily and Jennifer, and Ester, who is very much affected by her walking disability. The way to the church and to school is very hard for her. Maybe we can arrange a stay for her in a center for physiotherapy. Yet, Esther is always smiling. 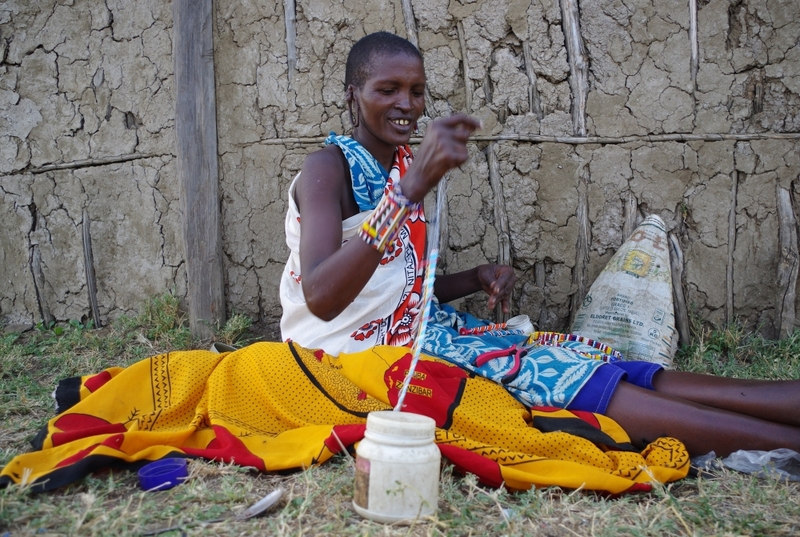 In the region around Suswa, there are several women who produce hand-made necklaces and bracelets. They try to get some money from that, but most of the time it is not enough to make a living. For whoever is interested, we could bring bracelets with personal names on it. Please get in touch with us. We want to thank all donors, supporters, friends and well-wishers of Home Care International e.V. for what they have done in 2015. A lot has happened and many children were able to join our sponsorships. As before we are always open and grateful for any comments, feedback, ideas and active participation of all kind. The team wishes you a healthy, happy, blessed and prosperous New Year 2016. The detailed annual report for 2015 is going to follow soon. 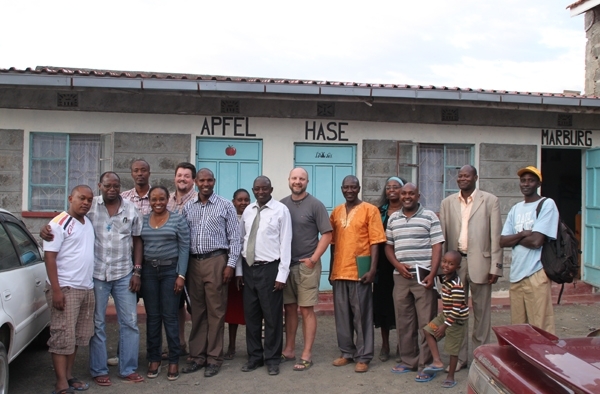 Some of the German board members together with two others went to Kenya end of December at the same time as every year. 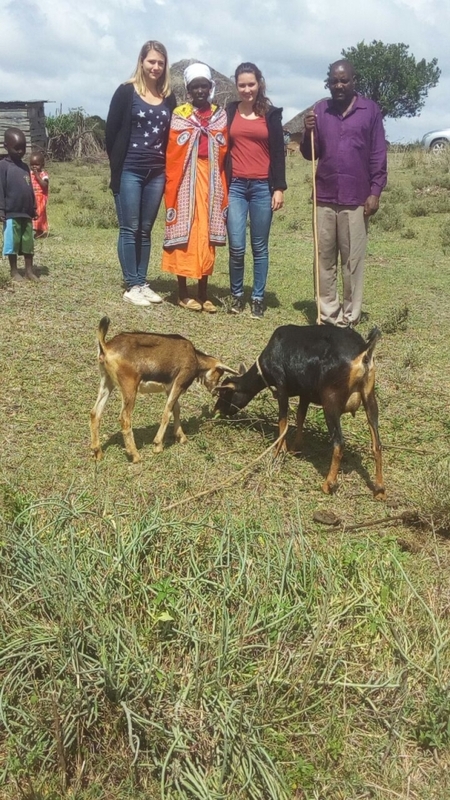 After visiting Loita Hills and Lake Bogoria, they helped again with the construction in Nakuru, and spend and enjoyed time with the girls and other godchildren. Furthermore, a big meeting with the whole team in Kenya took place like it did in January 2015 as well. 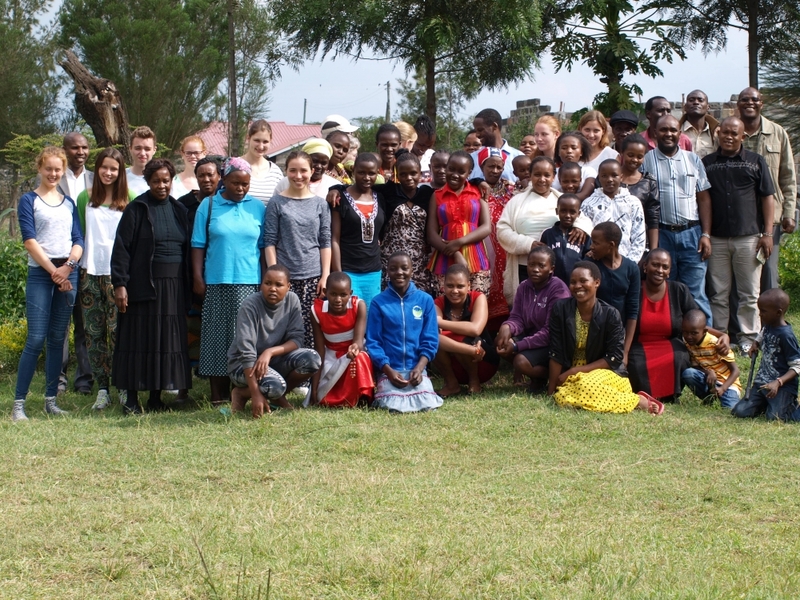 From November 29th to December 5th, eleven girls from the Home Care International Center visited the Diguna Youth Camp in Nairobi. Some of the girls had already participated in the camp in 2010 others came for the first time. During the camp, 250 young people from all over Kenya gather for one week to exchange experiences, to talk about God and to have fun and a good time together. 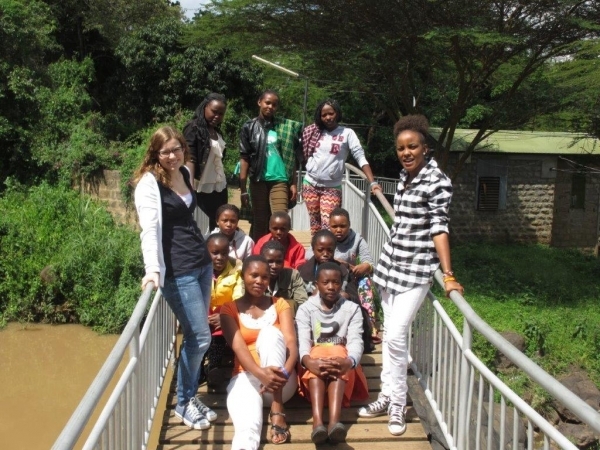 Apart from the girls, Emily, a former intern and social worker, took part as a group leader. Every day after breakfast there was a service and afterwards group discussion were held. After lunch, they had activities and some free time until supper. In the evening there were several things on offer like worshipping, dancing, singing or games. It definitely never got boring! The girls enjoyed the camp a lot. They liked the group leaders, made new friends, and enjoyed the good food and the games. They were really interested to learn more about God, his word and its meaning for everyday life. We thank all sponsors who this experience possible for the girls! Two good deeds within one day: „Christmas is approaching and what would be nicer than a Home Care International e.V. 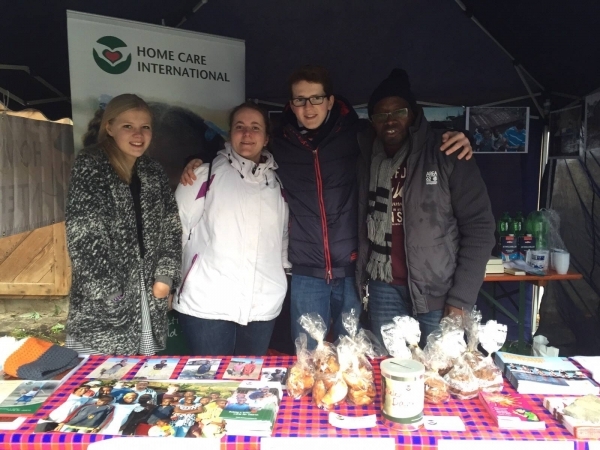 stand at a Christmas market?“ Nicolas Richter from Bad Homburg asked himself that question and with the support of Dr. James Karanja, Stina Wehrheim, Abbygail Müller and Simonette Velomahefa, he turned his idea into practice. The Christmas market took place on November 29th and in spite of cold and rainy weather, they sold all self-made cookies and Kenyan chai tea. The money was donated to Home Care International e.V. and will be used to support children in Kenya. 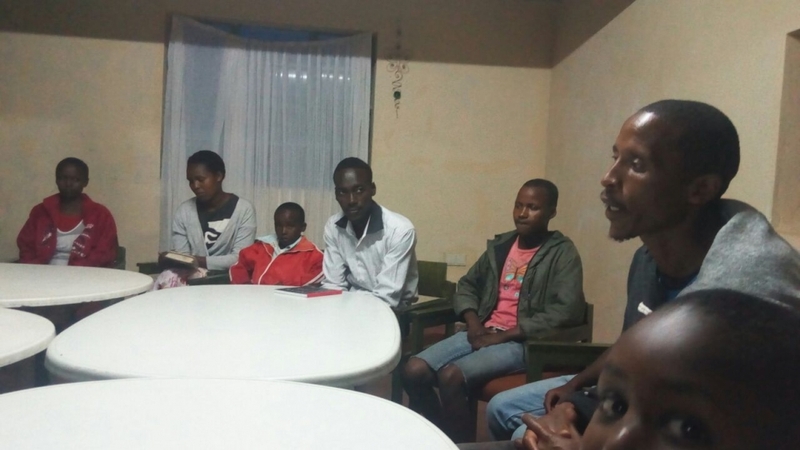 Several girls from the Center in Nakuru are going to attend this year's youth camp at the Diguna missionary station in Nairobi. They will stay for one week to do Bible studies, play games, have fun, enjoy all the activities and to spend a joyful time together with other teenagers and to gain many enriching experiences. The girls have sat for their exams and are now on holidays. Most of them are going to leave the Centre in order to visit their families. School will start again beginning of January. The Home Care Team wishes them all happy holidays! A small terrace towards the garden makes it now easier to get around the house and the stairs from the garden to the house are also not as high anymore as they were before. Additionally, a platform was cemented underneath the water tower. A second tank for the tower is supposed to be placed there. Due to many water tanks it had become necessary to install a pumped hydro storage in order to get water into each tank. Furthermore, the water tank on top of the water tower was a little too high for filling it with water from the public pipes since the natural pressure would not have been enough. 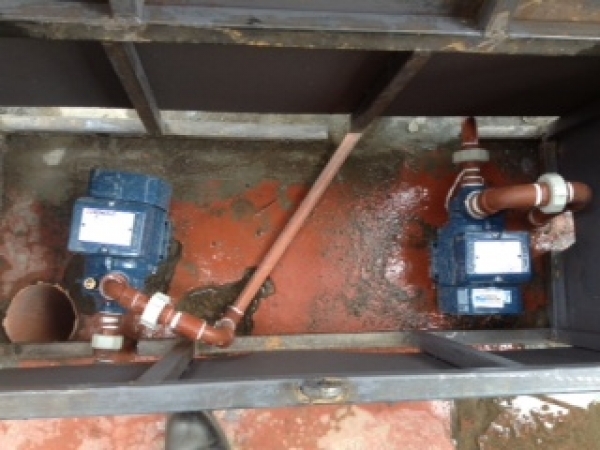 Therefore, floats have been put in all tanks so that the pumps can run automatically. 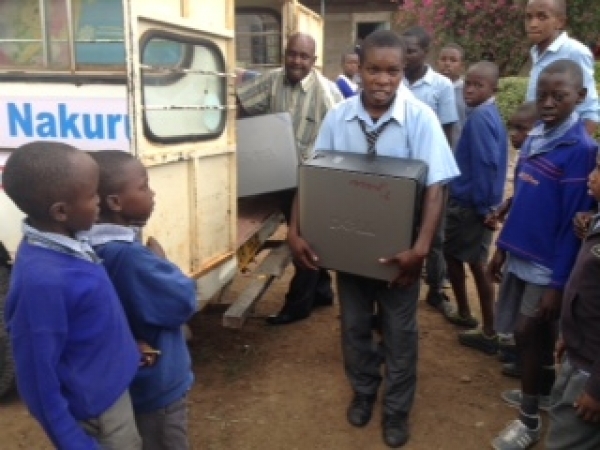 More computers from Marburg have reached children in Kenya. Kiungururia secondary school as well as Kiungururia primary school were equipped with computers and screens to be used for classes and work in the schools. Many thanks to the donors from Marburg. After the team had put up the water tank on top of the water tower in August, a safety railing and a ladder have now been built around it as well. 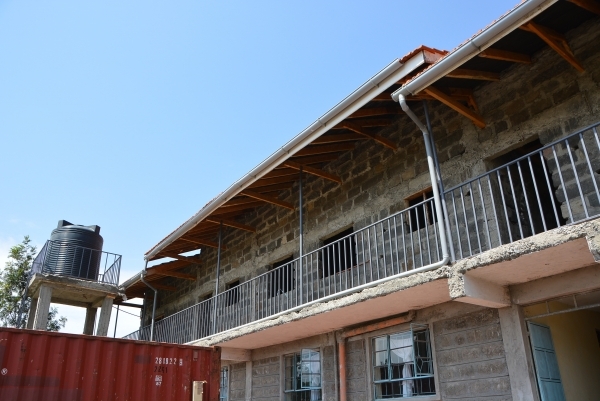 Apart from that another railing was also put around the balcony and in course of the construction work a roof gutter was mounted and connected to the water system. In that way the whole water from the roof can be caught up and be used for the centre. 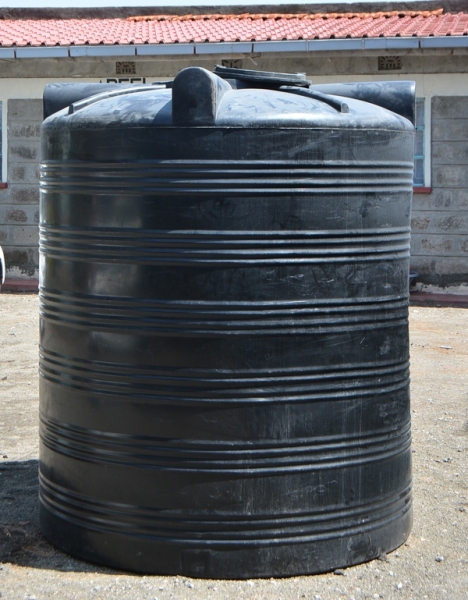 The second water tank for the water tower arrived at the centre in Nakuru. It is going to collect and save rainwater. Shelves have been set up in the store next to the kitchen so that several groceries can be kept there. Soon there will be cupboards as well for kitchen utensils. School could again not start right after the holidays. Teachers went on strike another time and therefore children had not been able to return to public schools until today (5th of October). 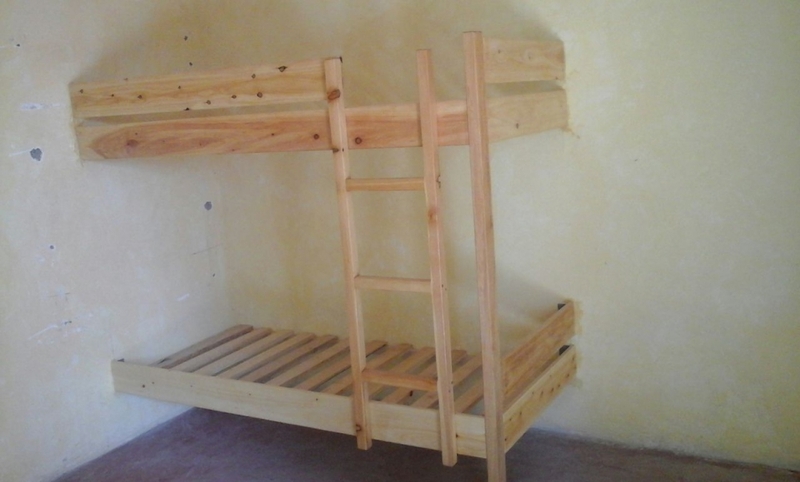 Additional construction material was used to make shelves that were set up in the rooms of the girls. We are currently raising money so that they can also have cupboards in a while. 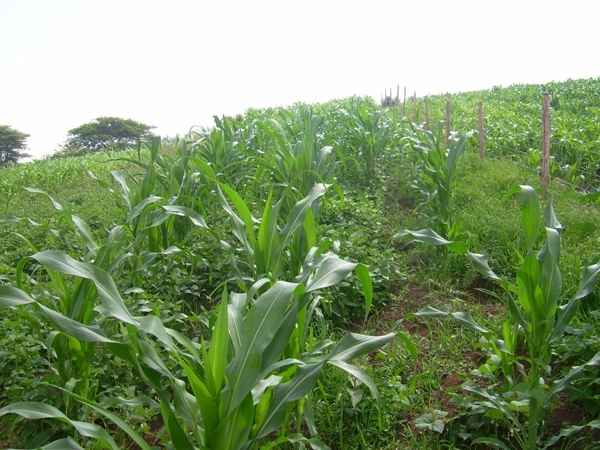 After the planting of maize and beans on the field in Solai end of April, the first harvest brought in more than 200 kg of maize. This was still less than expected due to lack of water and rainfall. We are awaiting higher yields in the future. The harvested maize will be brought to the centre so that they will not have to buy maize for the next three months. School holidays in Kenya have started just like they have here in Germany as well. Some of the girls have therefore gone back to their families. Before they left, they had a last meal together in the new dining hall, which was just recently painted in sparkling yellow. Most of the kids will return to the Center on the 30th of August. 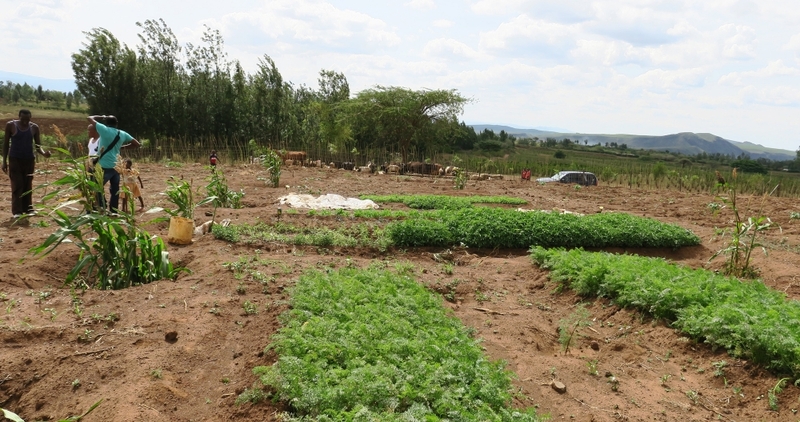 Donation of the company "Pfeiffer-Vacuum"
After maize and beans had been planted in April on the new plot in Solai, the first beans have been harvested now. This provides the Center with more than 100 kg of beans. The maize is going to be harvested next week. We are looking forward to seeing how much this is also going to be. Many thanks to all who help with the harvesting. 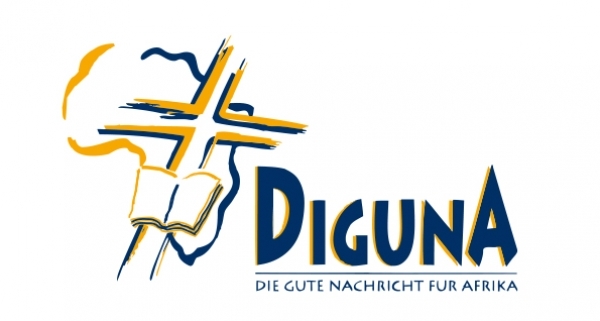 Our general assembly took place on the 25th of July at a church in Bad Homburg. Apart from a review of the year's events, the presentation of the financial report and a few administrative points, all members of the chair have been reelected except one. As new member we welcome Ann-Kristin W. After the two hour meeting we listened and danced to the music of Perschya Chehrazi. All in all it was good to have this opportunity of exchanging ideas and opinions and we thank all for the positive feedback to the work of Home Care International e.V. We hope to see you again and many more at our next general assembly next year around the same time. There will be another trip to Kenya in December. We are again looking for active participants to help in Nakuru and who would like to get to know the country or to rediscover it in a special way. Please contact us if you are interested. The team will leave right after Christmas, probably on the 26th or 27th and will be back on the 8th or 9th of January 2016. 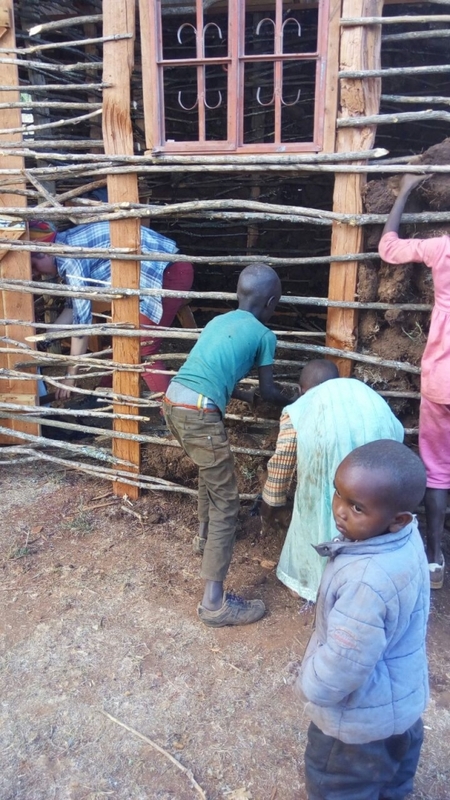 The sponsor of Ndama bought goats and chickens for the family, so that they can build up a small self subsistent existence near Korr in Northern Kenya. Additionally, a small hen house was built. We thank the sponsor and Pastor James in Korr for their support. 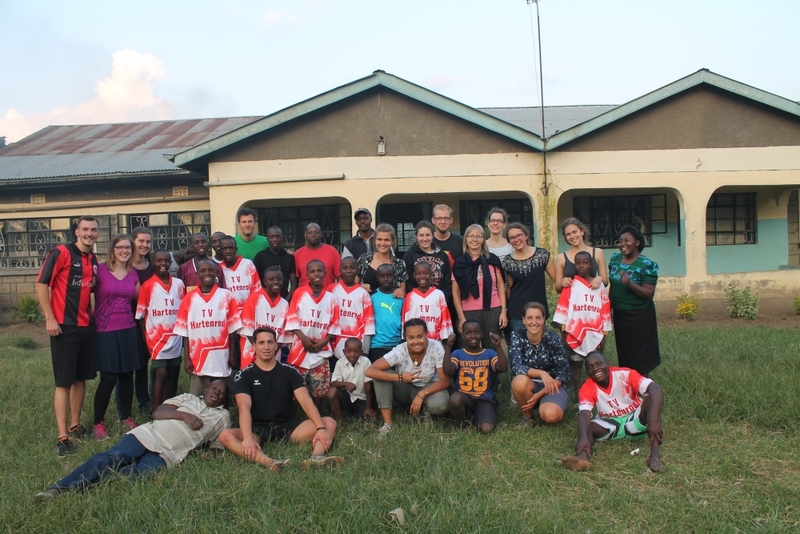 Like the last years a small team from Germany will go to Kenya this summer. They will leave mid-August. There are a few tasks that need to be done like painting, gardening, distributing things from the Container to godchildren and others and of course visiting godkids on the journey. We wish all travelers a lot of fun and good experiences. 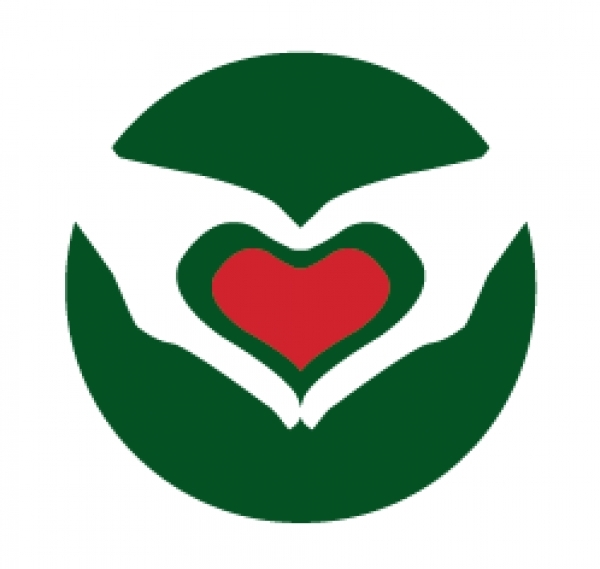 Home Care International e.V. received 353 votes within the „DiBaDu and your association“ voting and got therefore placed on rank 422. We lacked 874 votes in order to be placed among the first 200 winning places. Unfortunately, Home Care International e.V. will consequently not receive any money, we can only still hope for special donations made to non-profit organizations. We thank all who voted and maybe more votes can help us next year to be among the winners. If anyone has ideas of how to spread the voting initiative more effectively, you are whole-heartedly invited to please share them with us. 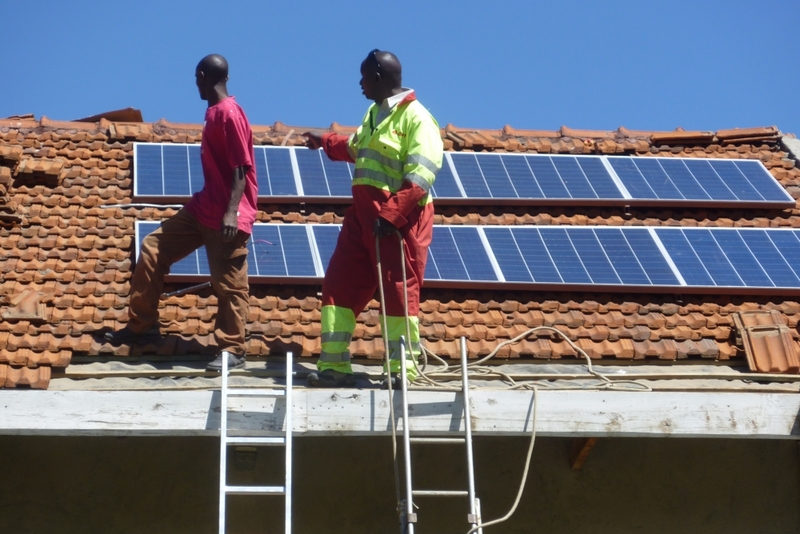 We are currently looking for companies or persons willing to co-finance a warm water solar panel. The pipes for cold and warm water are being laid throughout the whole Centre at the moment. In order to have a warm water connection straight away a solar warm water system shall be installed to the southeast. It shall be placed near the water tower on the roof. In case the need of warm water rises we can eventually install another solar warm water system towards the southwest later-on. A first tank for the water tower was delivered this week. It was financed through „Fruit Tree“. A second shall be bought soon. The water tower will provide the whole Centre with water through natural pressure. Afterwards the cold water system is also supposed to be installed. On the new plot of land in Solai maize and beans had just been planted end of April. Yet, they are already growing tremendously due to the fertile soil, a lot of water and warmth. Phillip is currently doing an internship with Home Care International e.V. in Kenya. Among other things he has painted all windows, doors and the dining hall. Thank you, Phillip. It truly looks great! 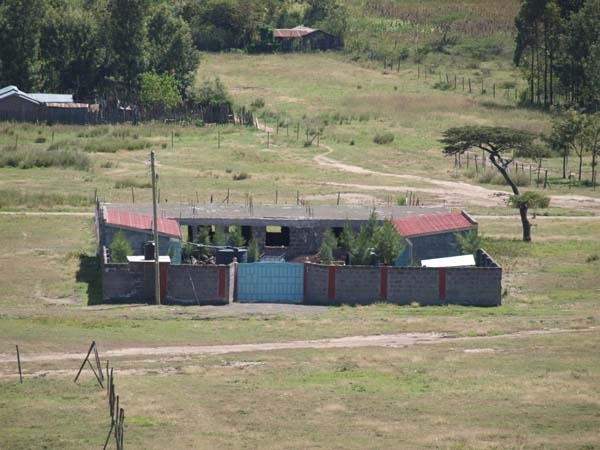 View from "Free area" over Nakuru town and Lake Nakuru. From today the flooring of the ground floor is complete. 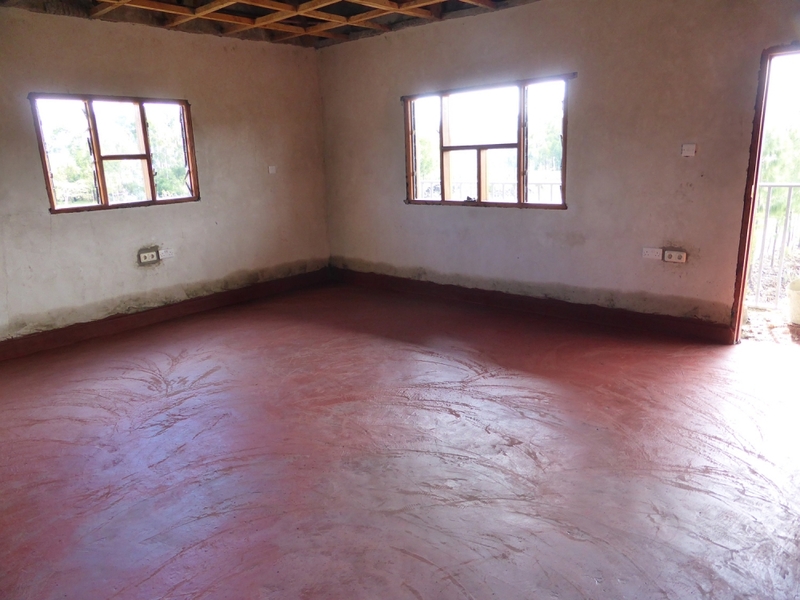 During the last three days workers finished flooring the kitchen, the store as well as the dining hall. As soon as it has dried enough, electrics and water pipes will be readily installed. The last step before furnishing the rooms will then be to whiten the walls. For the furnishing we still need some money in order to get carpentered wooden shelves and cupboards. 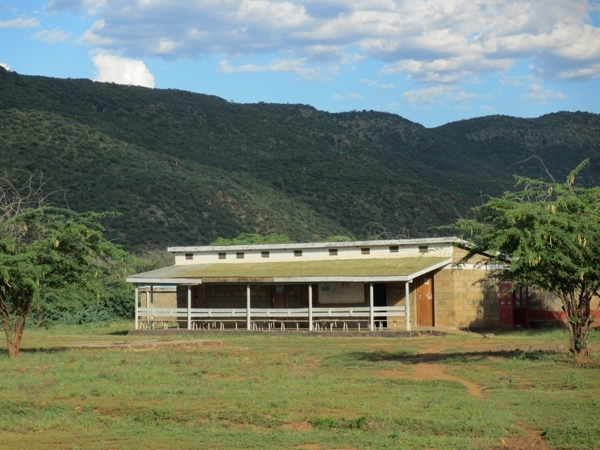 Pupils in Kenya are now on holiday for 3-4 weeks. 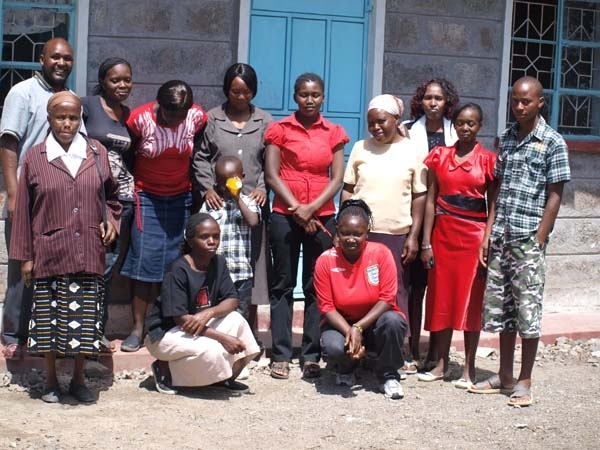 After having taken their exams the girls left the Centre to go to their families or guardians for the holidays. School will start again beginning of May. Let’s hope teachers are not going on strike like last time. 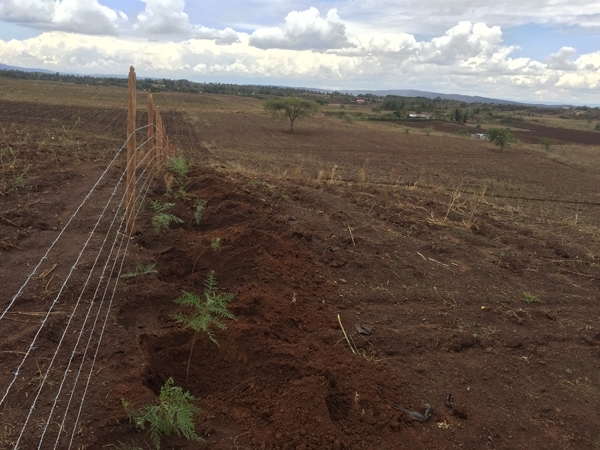 Reuben and I planted more than 300 trees on the plot in Solai. Hard work! Thanks to Reuben and his son for their effort. Next week the land will be ploughed and maize and beans will be lined out. I hope everything will grow and thrive to benefit the girls in the centre. Finally it has started raining. After a long dry season people, animals and plants are happy to have enough water again. Everything looked so dry and nothing could be planted. Life is going back to normal, fields are tilled, trees planted and the construction work with high water use will be started. Today we started to unload the container and will first put the things in the future dining hall and sort them there. 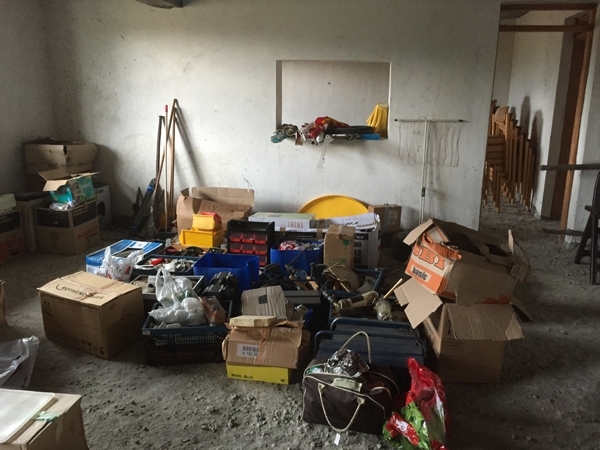 Some of the things will be stored in different places and then be distributed further. This is a group of young boys from the church in Korr (Northern Kenya) who are talented in Soccer. They call themselves 'Young Rovers' and dream to become the best team in Kenya. They are looking for sponsors to assist them with shirts, shoes or footballs. 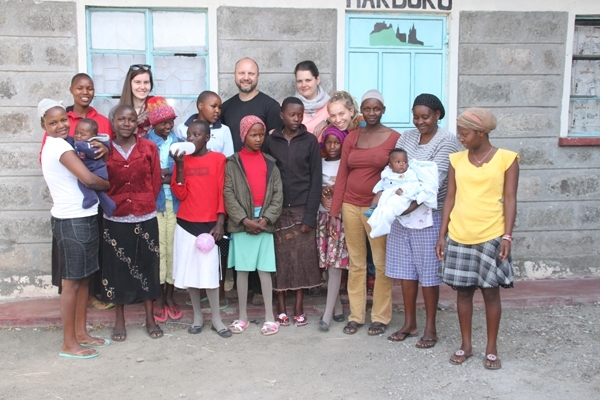 James made a trip together with five girls from the Centre to Solai to visit Reuben and his family. 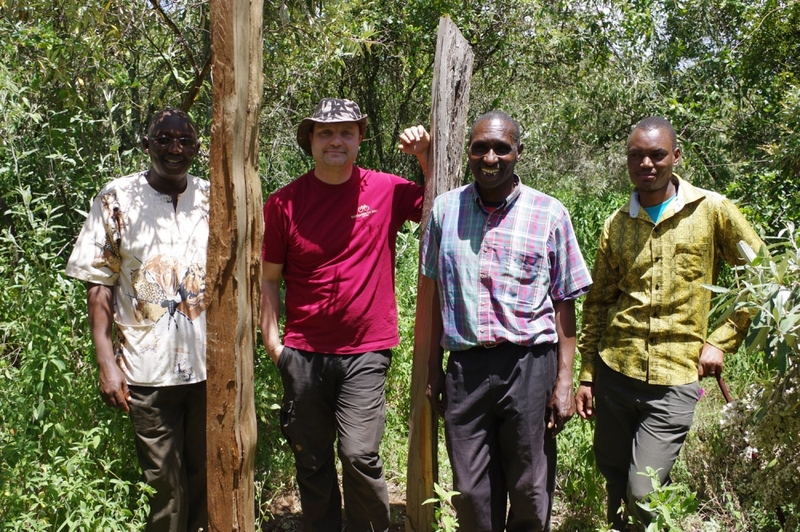 In Solai we also bought some land in order to plant trees for firewood and to grow food for the Centre. 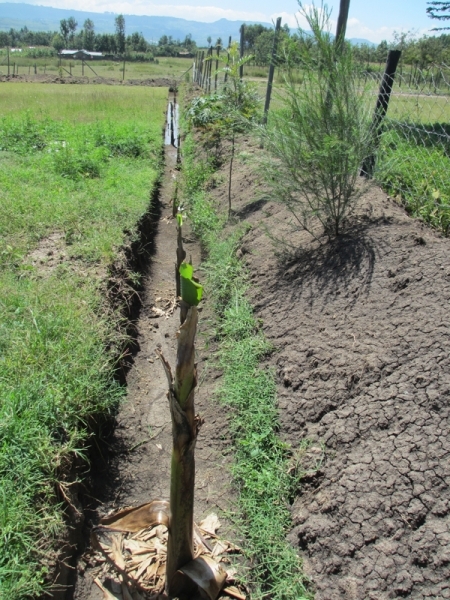 We are still looking for donors to fund the fencing and the saplings. 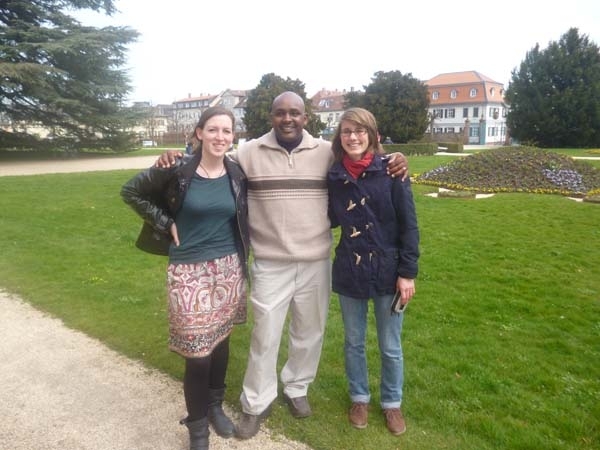 The first part of our Kenya team arrived well back home in Germany with a lot of impressions and new experiences. They visited many children. A more detailed report about the journey will follow soon. Baby Michal is slowly recovering. She still has fever from time to time and is less active than she used to be, though. Currently, doctors try to find and adjust the right doses of medication for her. We continue wishing her a good and quick recovery and that smiles will come back to her face more frequently. The new year in school starts with teachers striking in public schools. When the girls arrived early on the first day, they were told that teachers are striking in Primary School for about two weeks. They advised them to wait for news when classes will be on again. We thank all sponsors that brought us gifts for the kids. Our suitcases are full and we will take everything to Kenya on the 26th of December – the Boxing Day! Dear friends and sponsors of our kids in Kenya, With all our hearts we would like to thank you sincerely for all your interest, trust and support in 2014. Special thanks to all sponsors who supported Home Care International e.V. and our projects this year. It makes us and also the children in Kenya very happy that you decided to do so! We wish you and your families a blessed Christmas time and a good start for 2015, good health and happiness for the New Year. In the name of our organization we greet all of you and we are looking forward to keeping you updated about Kenya in the coming year, too. We kindly like to invite all sponsors, members and friends to the general meeting on 18th October at the Christ Church in Bad Homburg, Stettiner Street 53, 61348 Bad Homburg. We would like to start with having lunch together and afterwards to report and discuss about current tasks and the overall work of HCI. 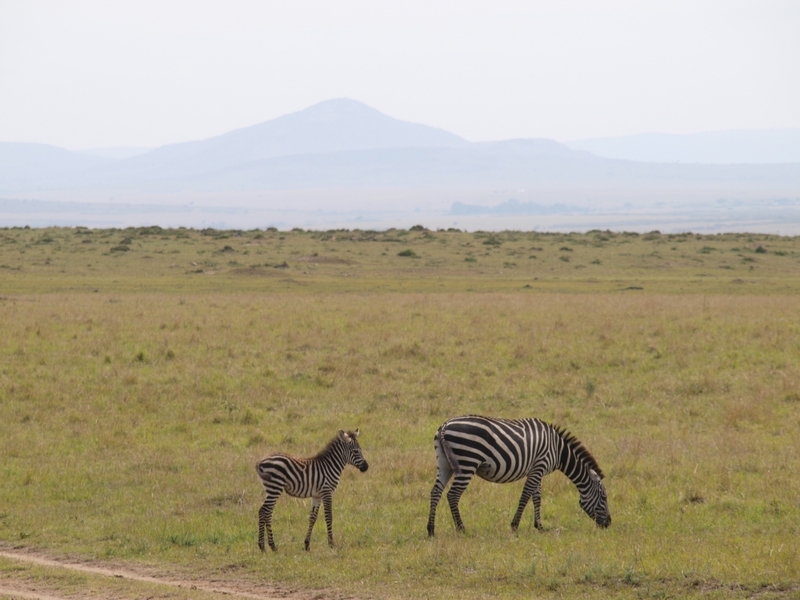 We are planning another trip to Kenya probably from 26th December 2014 till 8th January 2015. Apart from staying at the centre we want to travel further north towards Marsabit and Samburu passing Lake Bogoria on the way back. So who wants to come? :) Please contact us as soon as possible so that we can book a bus for the journey. 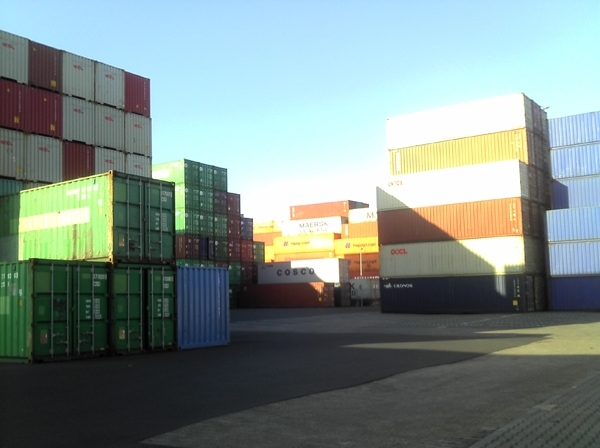 Last weekend James and Christian were able to finish filling the container with the assistance of two others. 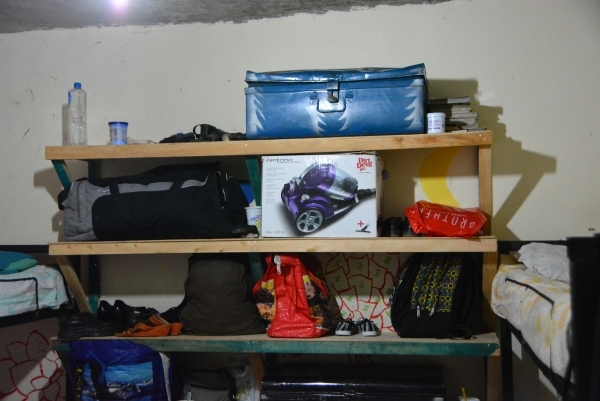 It has not been that easy getting all things together since there has always been more space after packing well. Now it finally start its journey to Nakuru and we thank everyone who donated, organized, packed, transported, contributed or helped in any way. Thank you all! We hope everything will arrive well in Nakuru and that we can start unloading in December. The new water tower is close to finishing. The concrete still needs to dry, then a tank will be placed on top. Afterwards water pipes will be laid in the house. The pump filling the tank has already been bought. For now we only need ideas how to make it look nicer. How about climbing plants? Please share your ideas with us! Once again we were selling waffles and informing people about Home Care and once again a lot was going on at the Up2MeetU youth festival. We want to thank all who came and contributed. 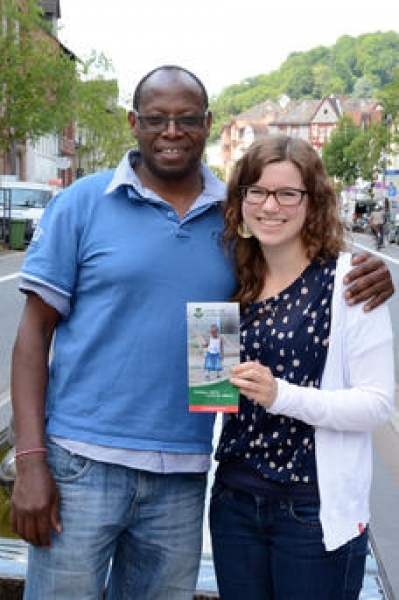 This time we ended up with 151,60 Euros in our donation box and are happy to say: Asante sane! 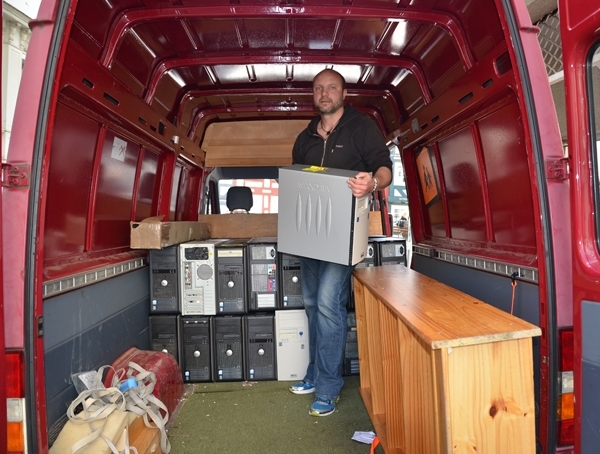 Since the local newspapers "Hinterländer Anzeiger" and "Oberhessische Presse" had published about our container, we received several phone calls and Emails from people who have some things they would like to contribute. Currently we are on the way to collect and transport them to Mainz where the container is based. 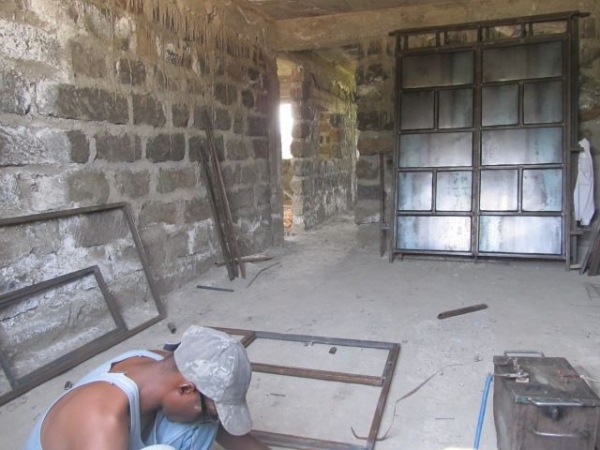 We expect it to be full soon and at this point we would already like to thank all donors for their support. Maybe we can plan to load the container again next year? On the 24th of March the city of Marburg handed over 50 PC’s to Home Care International. The magistrate opted for contributing the computers since they know the projects in Kenya as well as others on the Philippines through personal contact. The Team around Dr. James Karanja (1. chairperson) and Christian Frank (2. chairperson), who received the computers, has already been in contact with the technical services for some time. This year they had the possibility to support the work of our organization with simple means. At the moment the computers from the administration for the city of Marburg have to be replaced by another model. For this reason, the opportunity arose to donate 50 completely functioning computers to Home Care International e.V. The Team of Dr. James Karanja and Christian Frank will bring the computers in Kenya to meaningful further use. The roof will soon be finished. A bit of work on the edges still has to be done and the roof gutter is still missing. This will be settled during the next days and the construction will finally be save from rain. 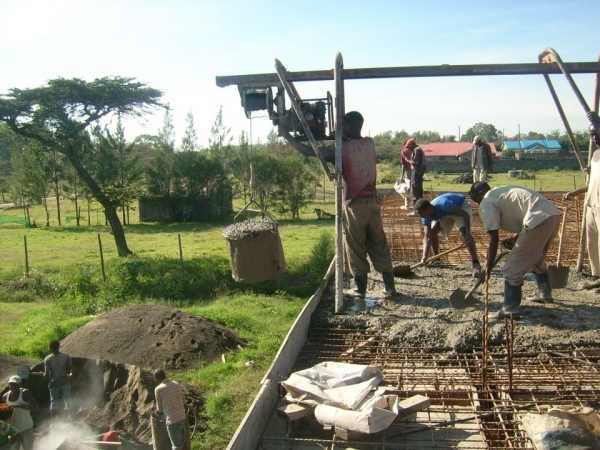 Thanks to all donors, workers, prayers and contributors who have accompanied our building process so far. We can now start with interior work and makeovers. At the moment the container is loaded step by step. The first big items, tools, cloths and much more is already on board. A few things are still needed though. We will provide a list for those. The first bricks were put on the roof. The roof construction is complete as well. Soon the house will be safe from rain. We are planning another trip to Kenya end of this year. 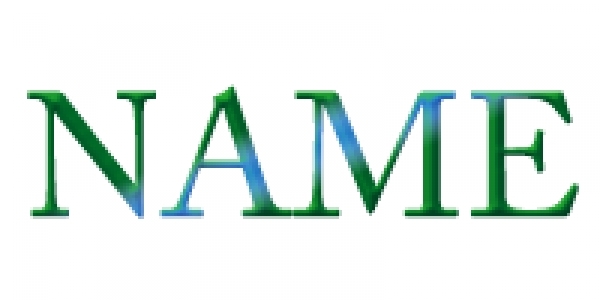 James, Christian and other members will probably be in Kenya from 26.12.14 until 9.01.15. We hope to dedicate the Home Care International Centre officially together with partners, staff, guardians, parents, the children, and everyone who would like to join us. Until then we have still a lot of work to do on the building. We are also looking for a sponsor for the event. In summer several people will be going to Kenya again. James will be there with a smaller group from 17.8.-04.09.2014. Apart from one week working at the centre there are no plans yet. So anyone who would like to join, just contact James or write an email to HCI. The annual report 2012 -2013 is online. James gives an insight and overview on what happened during the last two years. Yet, it does not claim absolute completeness with all details and happenings. The loft conversion is making progress. All bars and timber are cut, shaped, chopped, painted and adjusted to the roof at the centre. It takes time, but we hope that the first bricks can be laid beginning of march, so that the house is able to dry completely. Until now they are still stored in the building downstairs. 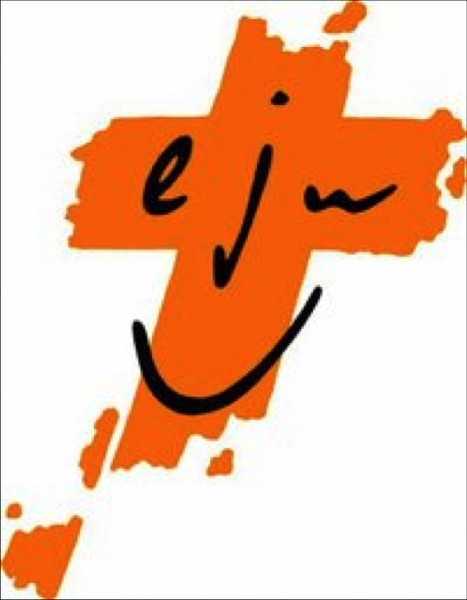 On 28.02. a Chili - Chapati - Chai - Cinema - evening takes place at the localities of the EJW, Haeberlinstr. 40 in Frankfurt. It will start at 7.00 p.m. It would be nice to see many of your faces again and also to take the opportunity to invite new people, too. 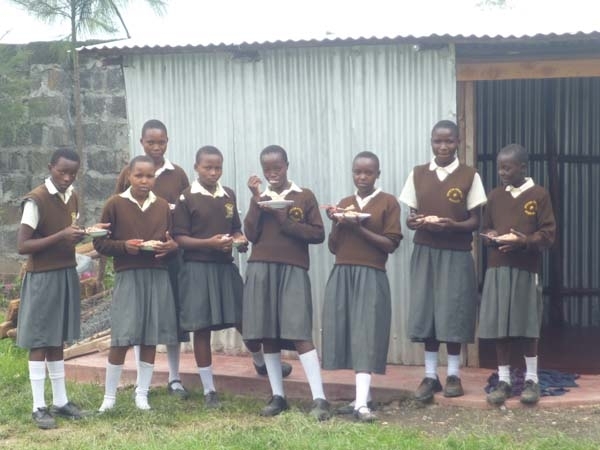 An ethics class of a secondary school is collecting money for the children in Nakruru. Home Care appreciates the fact that topics of this world are being discussed in the course of a school lesson. We all are responisble for our families, our society and also for people in need throughout this world. Thus, we thank all sponsors, and if there are further ideas in this direction or in case one wishes to have a member of Home Care in class just email us. We will try to be there! 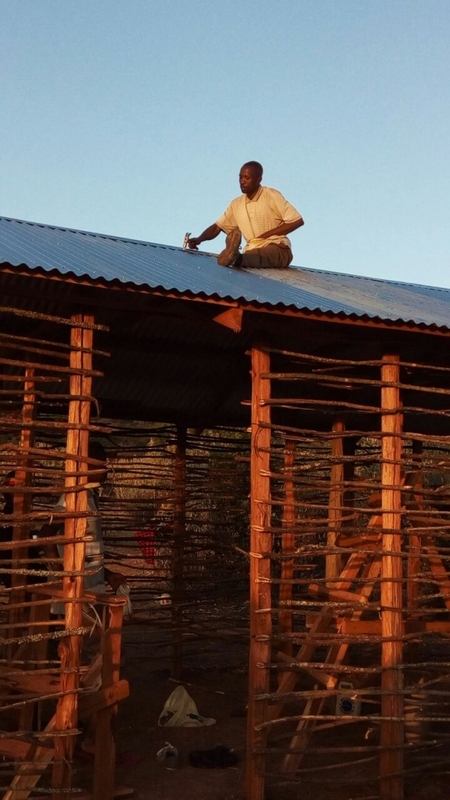 After the receiving of all timber and bricks, the working on the roof continues. Everything is cut manually and works a little different then here in Germany. The timber will be painted right at the centre. According to plan the roof should be finished end of January. 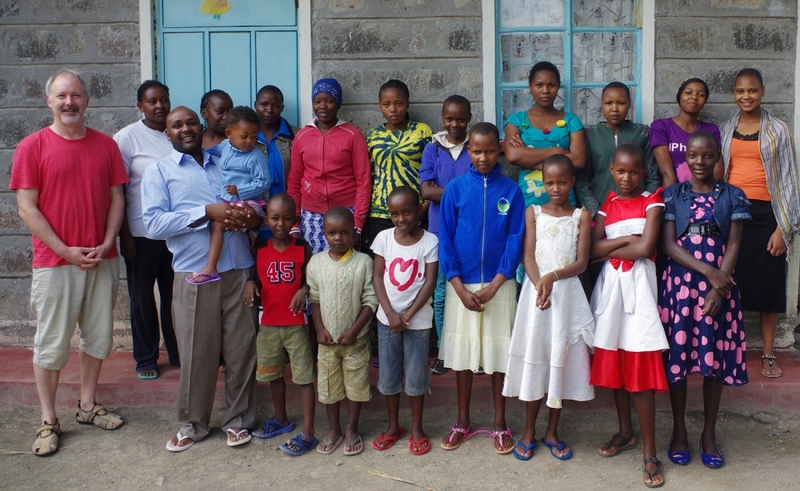 Within the topic a religious education class - "children of this world" - a teacher of MPS Perftal starts a pen friend correspondence with the godchildren in Kenya. For this the pupils wrote letters shortly before Christmas including information about their personal lives and they describe their daily life in school. James took these letters to Kenya in December. The first responses are already back in Germany. We will see how the pen friendships will go on. 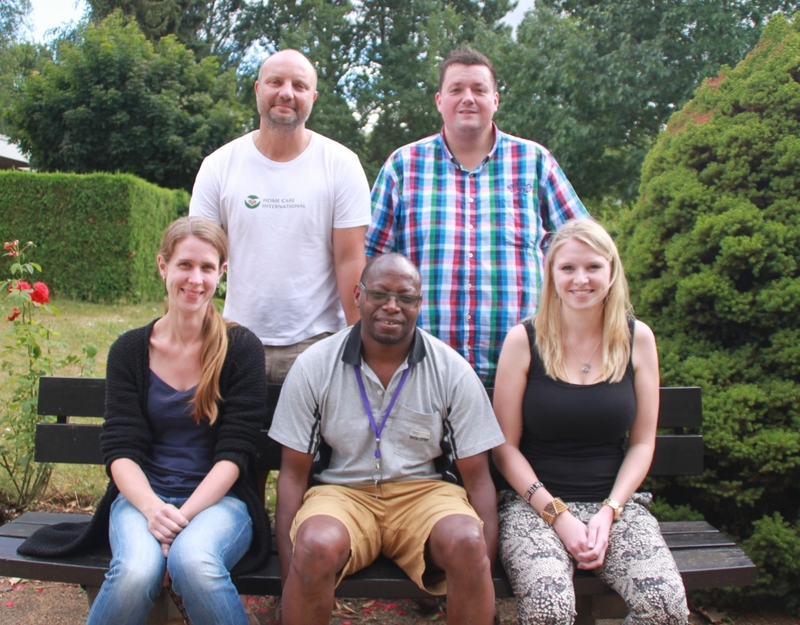 A small team coming from Saxony and Hesse works for one week at the centre over New Year. They work on the building, outside the house and in the garden. Furthermore, more doors get another paint and manure is put to the plants. 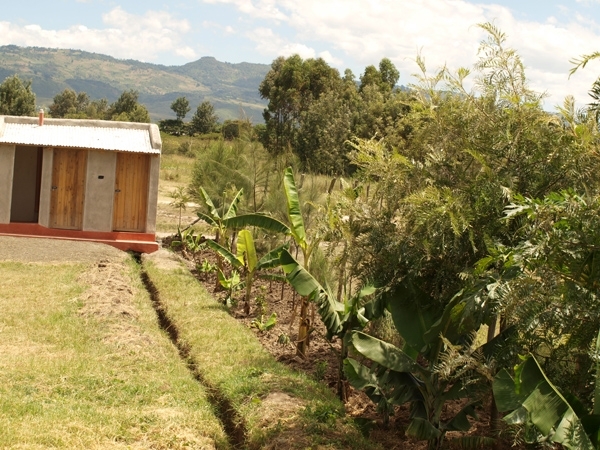 The second house for toilets is now finished and is used by the girls. One can also see that the trees, bananas and flowers are growing and thriving. Let's see when the first avocado or banana harvest will be. Within a few Christimas bazaars in Cyriaxweimar, Bechlingen and Marburg donations for Home Care were collected. We thank all who participated for their ideas, commitment and time they invested for children in Nakuru. 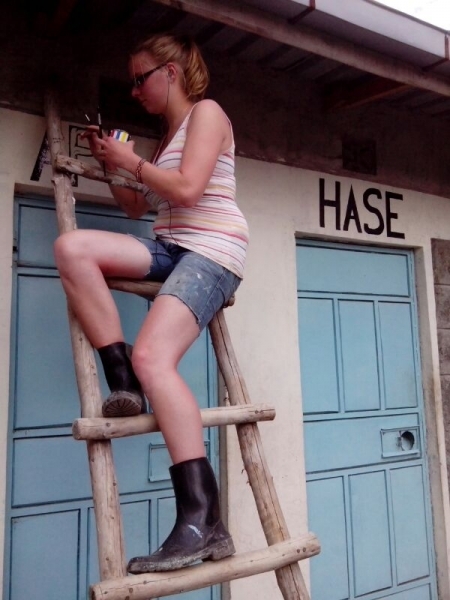 The two volunteers Annkristin and Julia have come back to the German way of life after their 5 months of stay in Nakuru / Bogoria. We thank both for the work they did on the building and with the kids. On the picture you can see them on a wedding in August. A detailed report will follow soon. 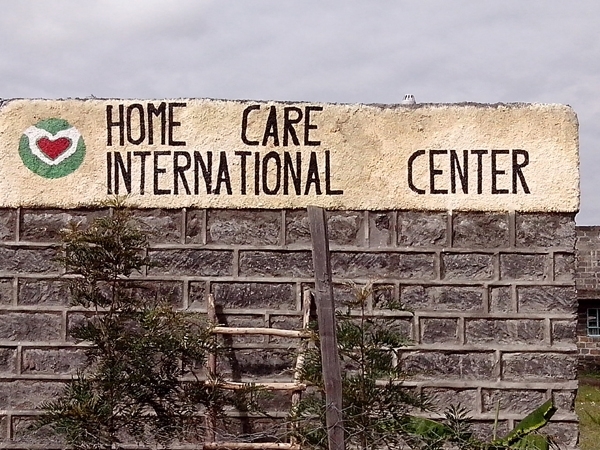 Home Care - Team thanks all supporters, sponsors, prayers, helpers and people with a heart for the children in Kenya. We wish everyone a blessed Christmas and a healthy, successful and happy New Year 2014. 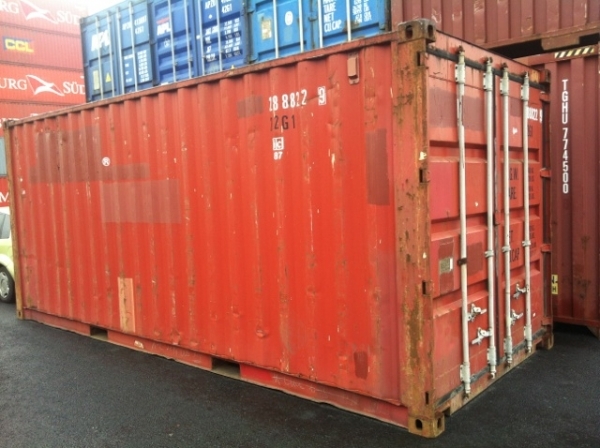 The container is placed at the port now. Everything is prepared for it to be shipped to Kenya. Everyone with things and material that could be send should contact us as soon as possible please. We will starting loading mid-January so that it can reach the children as soon as possible. The leaders of the centre got another baby on 13.12. After the birth of their son they were now blessed with a baby girl. We are happy for them and wish them all the best, God's blessings and a lot of fun with their newborn child. Who is reading the updates? Who is actually reading the updates on HCI website?? We would love to hear your opinion about them through using the comment function. The creative talent of Julia, AnnKristin and the other girls is now everywhere to be seen. They painted all the names on the doors in a very creative manner. The girls and people form HCI decided not to give the rooms numbers, but names. They voted for their favourite ones and chose names of animals, cities, mountains, and fruits etc. Some are in German and others in Kiswahili/English. 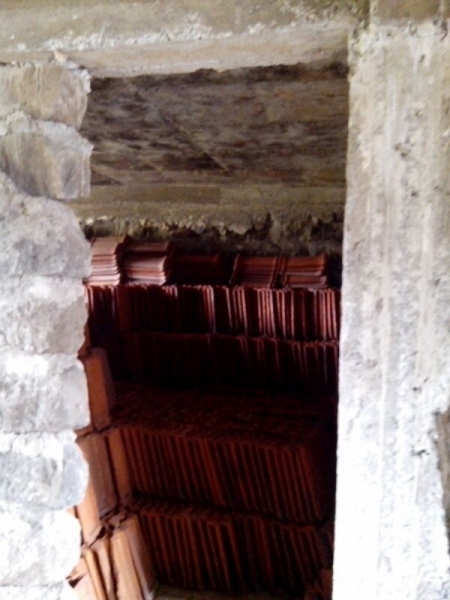 The second half of bricks has now arrived and been stored in the house. They are quite many, since the roof is going to be pretty large. 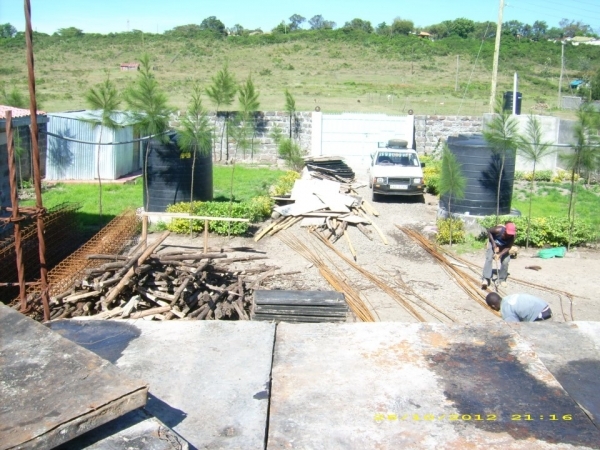 Timber has also partly been delivered, so that we can start constructing the roof. This has urgently been needed and we hope that rain will not be able to come in that easily anymore. For Agnes and Helen final exams in their last year of school have started. For girls in Primary (Esther, Purity und Ann M.) they will start on 11th of November. Please include them in your prayers and wish them concentration, calmness and strength. If you want to donate for us you can either do this directly to the bank account or to the trust that was founded by students from the University of Frankfurt under www.klimaschutzplus.org/K+TT-list.php . We want to take the opportunity to thank all sponsors of the organization. We are thrilled again and again how people support us and carry the work of this organization. Thank you so much. The gables for the roof are now ready, meaning we won’t need a lot of stones in the future ;) In addition, after a lot of sweating the bricks have already been carried and stored in the main building and timber for the roof is in process. We will see when everything will be able to be put up together, because we still lack some money to be able to finish the roof. 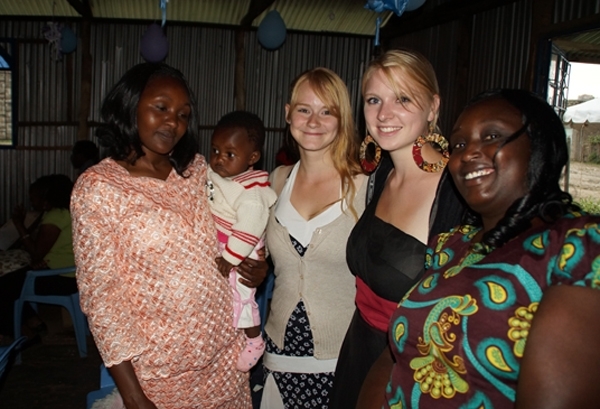 The German girls in Kenya and members of the Kenya Team are visiting sponsored children in their families. Most of the children stay with their parents or relatives. Many stay far away from each other, so it is not possible to visit more than two within one day. 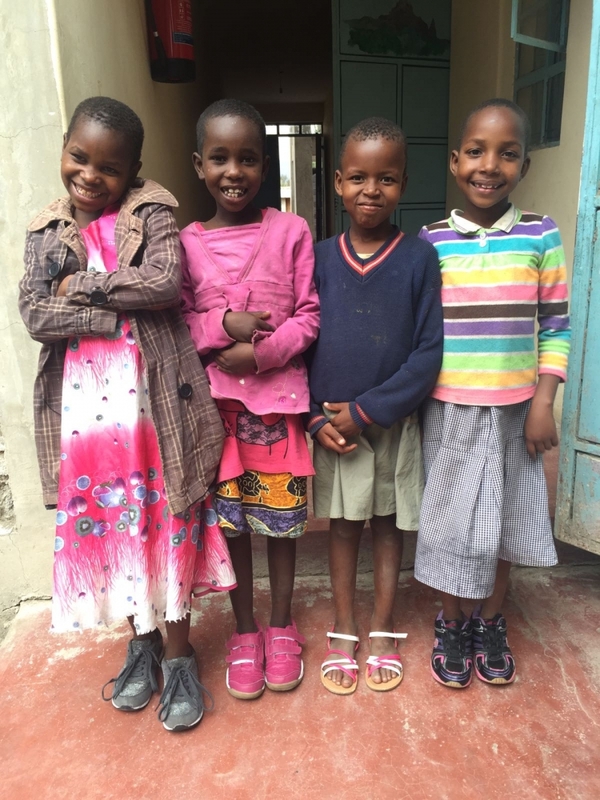 Apart from that, AnnKris and Julia are also going to school with the girls from the Centre in Nakuru from time to time to see how the daily life there looks like and to learn Kiswahili. They are ready. The stairs leading to the second floor haven been completed out of beton. The ledder can be removed and several people go up to the second floor at the same time without any difficulties. 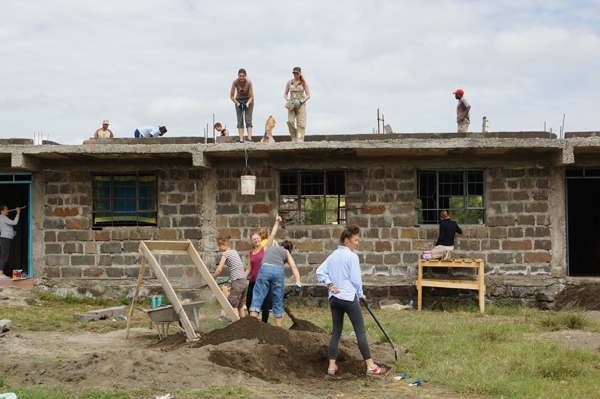 We got to know from Julia and Annkristin that the workers started with preparations for putting the roof. We thank both of them for keeping us updated. Window lintels, pillars and rooms are almost ready. The rooms have reached their height. 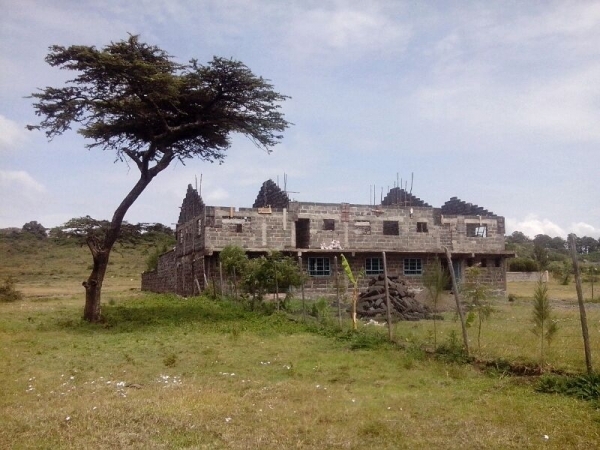 The external walls still lack some stones, but soon the construction of the roof will be started. 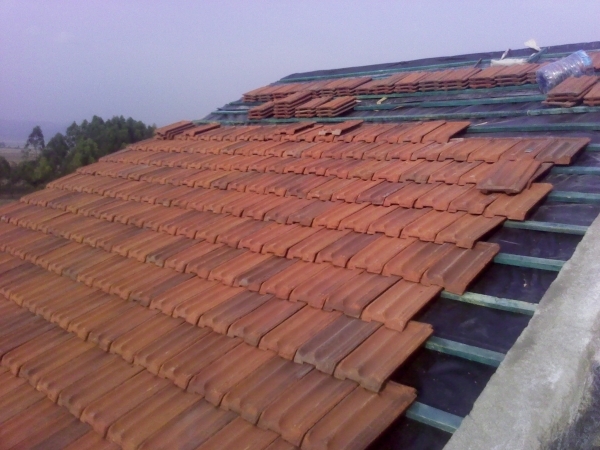 Lumbers and roof tiles have been ordered and will hopefully arrive soon at the new site. If all goes well the framing will be completed by end of September and then a lot of work for the interior construction will wait for us. After the EJW work camp a few people are still at the new site to contribute to the work in different projects. At the moments the girls are on holidays, thus a lot is being done for construction. 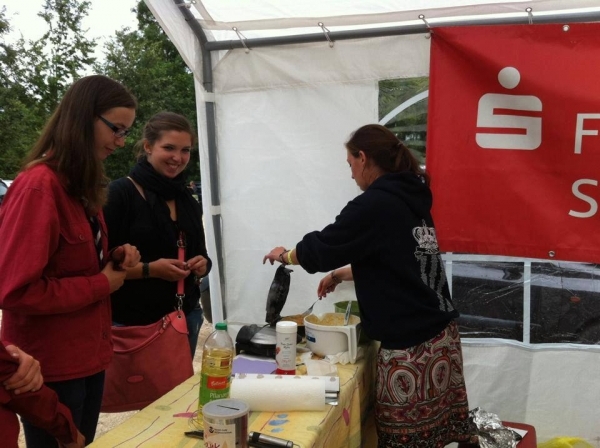 At this years UP2MEETU youth festival in Oberstedten on 18th of August we sold waffles for the kids in Kenya and informed people about HCI. Thanks to all who contributed. If you have more ideas how to collect donations – please comment. 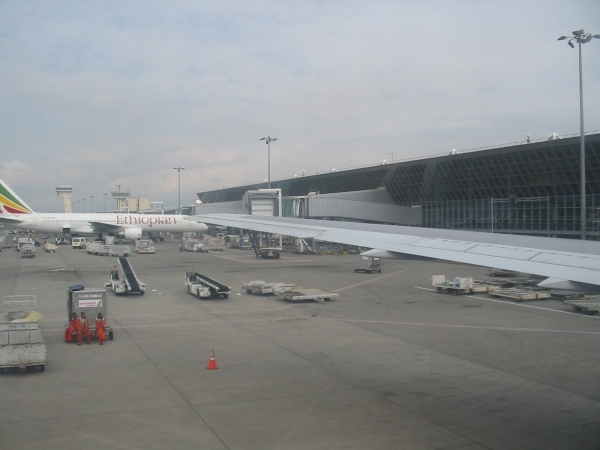 Despite of the fire at Nairobi airport last week the EJW team is back from Kenya. They are all healthy and enriched with a lot of experience after two weeks of work camp and they have been very successful. More information is coming soon. Before stones are used, they have to be mounted. Participants of the work camp have tried it, but it is tough. Meanwhile the second floor is getting into shape, one can more and more imagine how the rooms will look like. People of the work camp are working. The first six staff member of HCI fly to Kenya today. On the team are two girls, who will support us locally during the next 6 months. 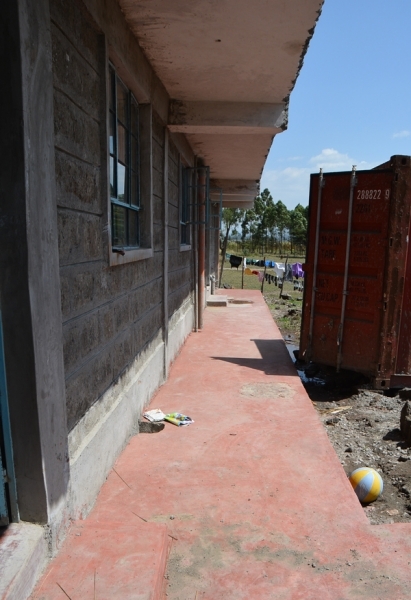 Apart from taking care of the kids, they will do some work at the construction and on other parts. Both are totally looking forward to the new experience with another culture and are excited to meet a lot of people. In order to improve the website and the work of HCI it would be nice to get some comments on the updates or just free to send us an email. Thank you. Kids and teenager collect money on EJW trips for children in Kenya. Thanks to the organizers, the kids and teenagers fort he donations. 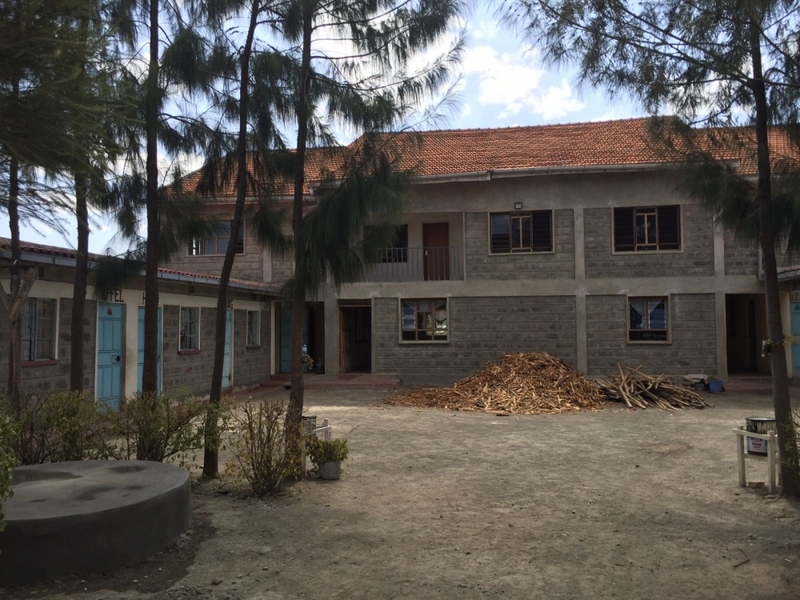 Some of the money will already be used on another trip end of July for the construction in Kenya and to buy some school equipment. 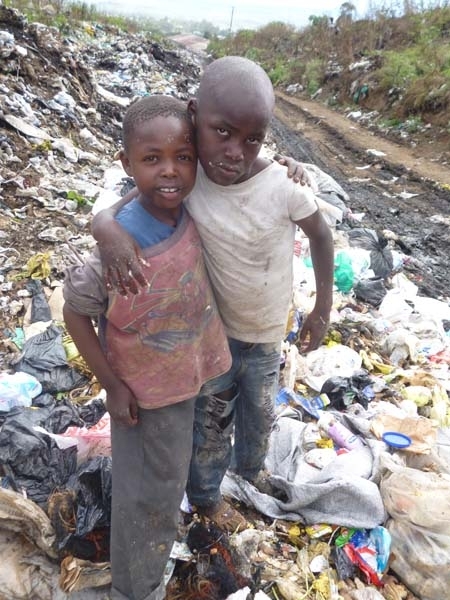 We several kids on our waiting list at the moment who are urgently in need of sponsors. Prices of commodities in Kenya also continue to raise more. In the chart you can see the inflation rate during the last two years. 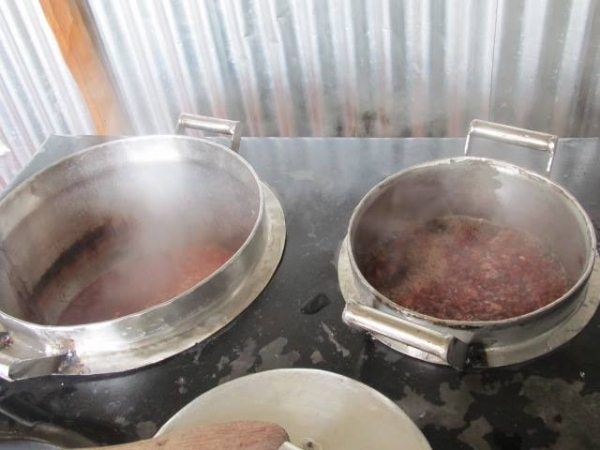 The new stove is plentifully used and serves mostly simple but nutritious food for the girls. 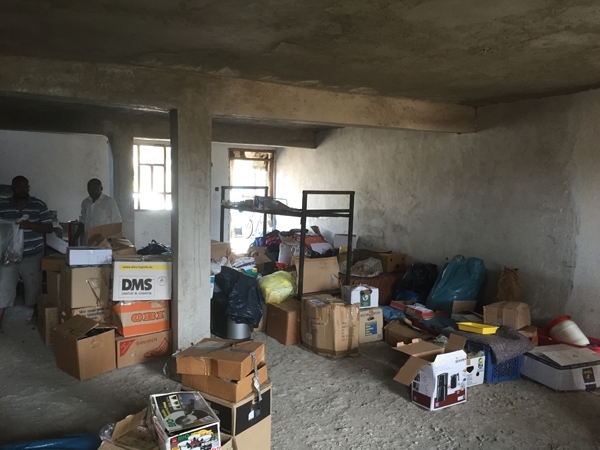 e are still looking for a container to transport all those many things that we have received from a lot of people safely to Kenya. Anyone who knows about one, please contact us as soon as possible. Before being plastered six rooms got new doors and windows. Two furhter doors for the back exists have also been fixed. Stones fort he second floor have arrived and are now being carved before they can be used. We have enough chairs and tables fort he kids now so that they do not need to eat while standing anymore. 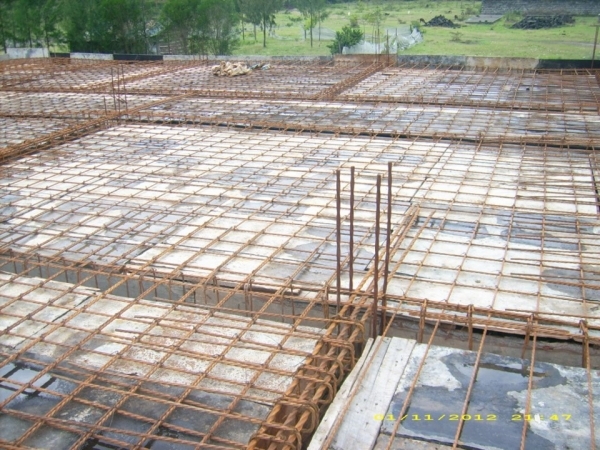 The construction of the second floor has now been started. 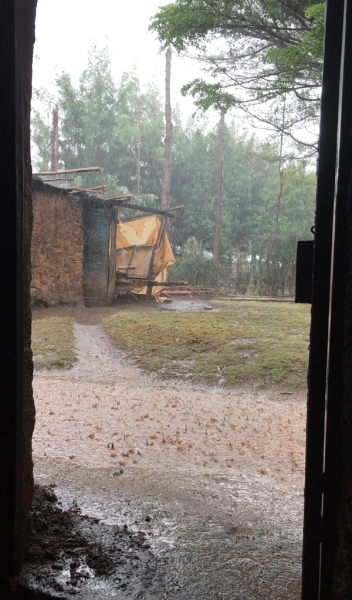 Due to the heavy rain it was not possible to bring so many stones to the site anymore. Soon it shall be continued but we still need more money for the roof. 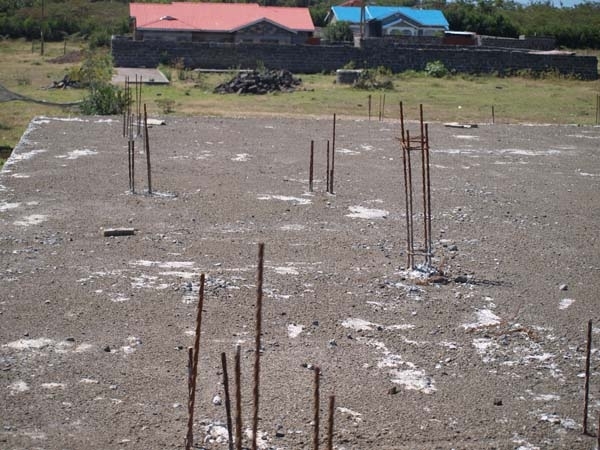 We are still looking for sponsors to give children a future outside the damping site. The best way would be healthy nutrition and education. Unfortunately without money, this is not easy to get. 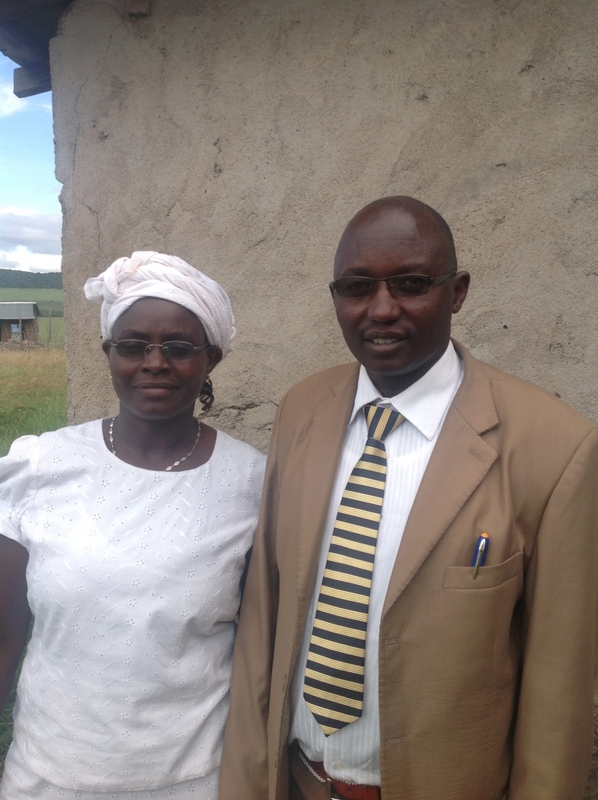 Pastor John Kimani, his wife and his son are now also staying at the new site. But for now he is visiting Germany at the moment to meet some friends and people, to experience life here and to see what HCI is doing in Germany. fter a long time of waiting, constructing, fundraising, praying, sweating and hoping it finally happened. The first 16 girls moved to the new Center. Not everything has been finished yet, but there are 6 rooms, a shower, two bathrooms and a kitchen for them. The girls who are going to the school nearby can come home for lunch. We are very happy and hope that the rest of the construction will also be finished soon. Pastor John Kimani is regularly visiting children at the damping site close to the old Upatanisho Girls Centre, which had to be closed now. The girls are supposed to move this week to the new Center at the end of the city. 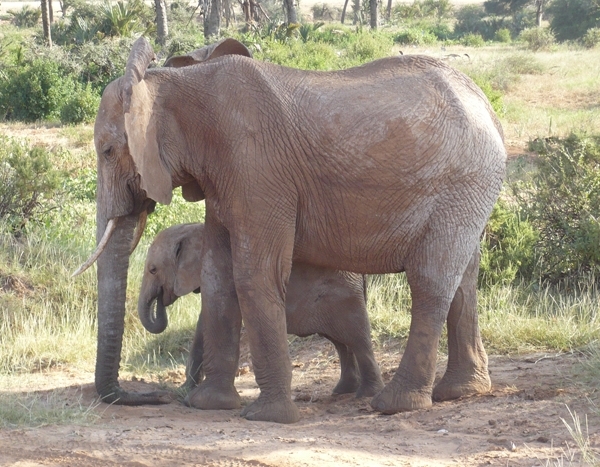 To get familiar with the kids at the damping site he visits them every other day. 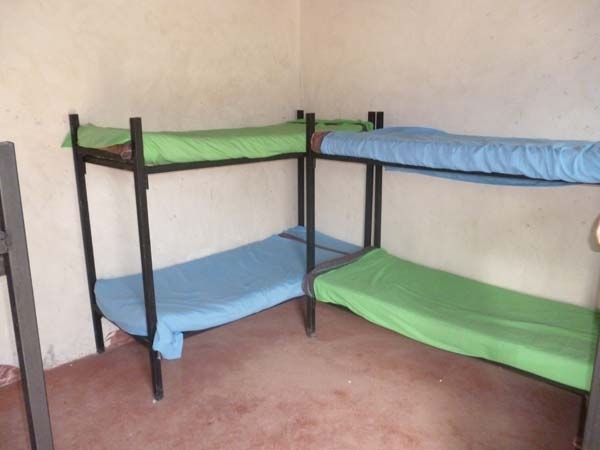 Meanwhile the beds have been put up and made ready waiting for the kids to come. Here a nice picture for you. It was worth planting some flowers early. In addition to the many trees there will be crop plants and grass to play on. Here a photograph of the compound from the western side taken from a little hill. Already looking good, growing and growing: the building as well as the plants, the people and God's assurance and graciousness. It is nice to share some of our wealth with a small place in Africa. The new stove for the kitchen has two deductions and is fully working. The first meals did taste very nice for sure. We still need shelves for the kitchen utensils and the food now. 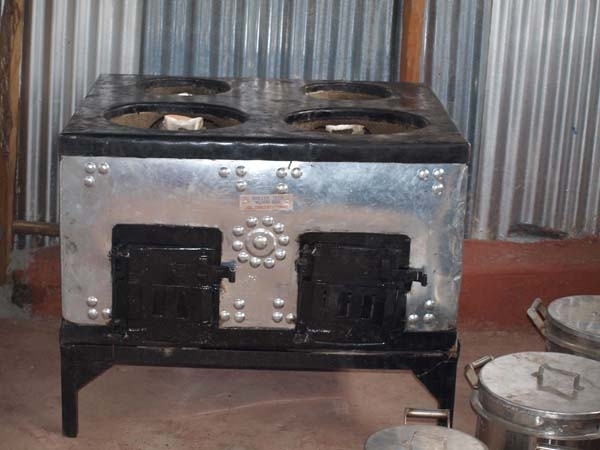 The new stove arrived and is able to provide for a lot of people. It has two separate parts for heating on which one can use four pots or pans at the same time. The pots have also been delivered together with the stove. So enough ugali, rice, chapati, samosas and many more things can be cooked, fried or heated now. New beds for the new site are spontaneously being welded out of iron. For now they finished around 30 beds. Mattresses will come later. 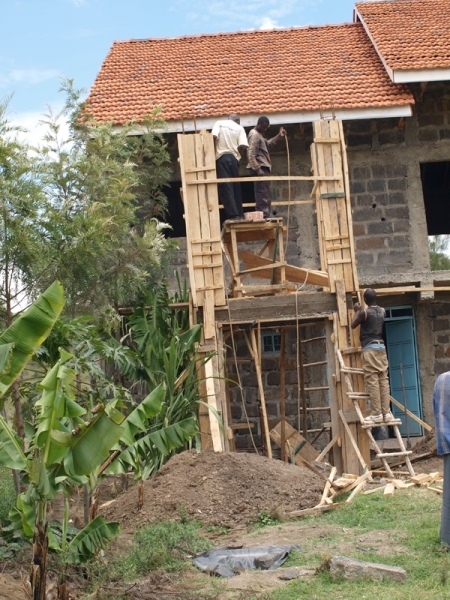 Since James, Jonas and Lena are in Kenya at the moment, they decided together with John Kimani to already show the parents of the kids the progress of the construction. Although many are very poor, they dressed up nicely and one can see how important this work is to them. After two months the subceiling is dry now and the planking has been removed. Some further works still need to be completed. Soon construction of the upper floor can continue. A few stones are already at the site. The steerages get iron for the concrete ceiling. 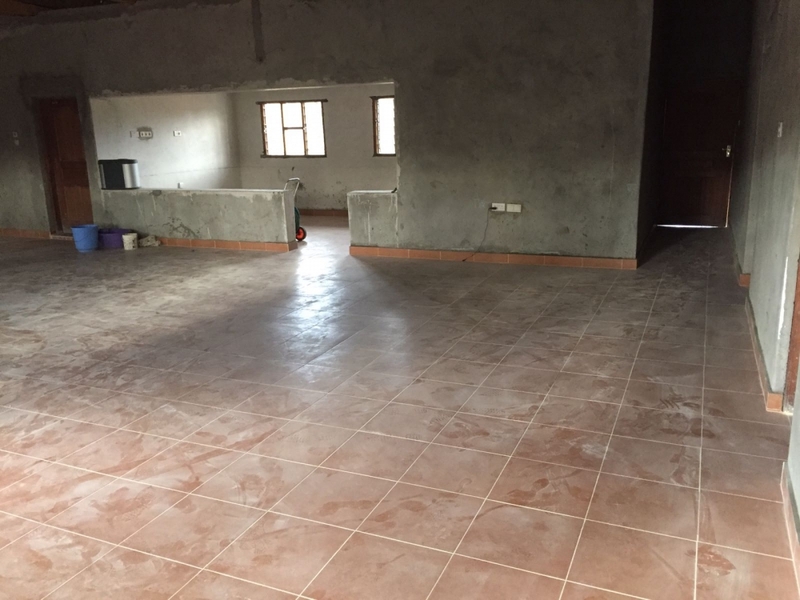 Soon, we can pour concrete, do flastering on the lower floor and install electric cable, finish the kitchen and the dining hall. Now it's done! 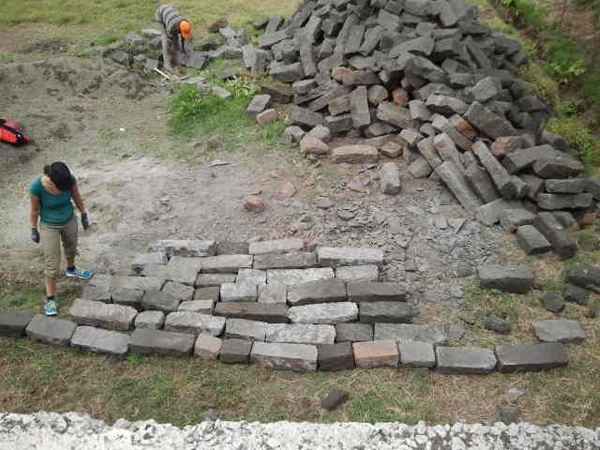 Thanks to your support we could finally start constructing the steerages on our new site. The shuttering is already completed. 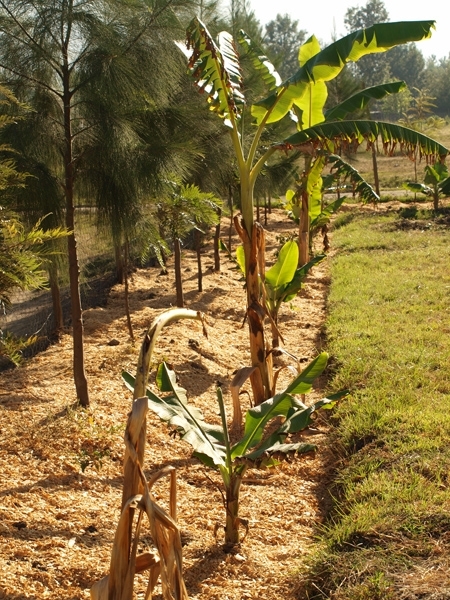 In order to secure some food for home consumption some bananas were planted around the compound. In two years they can be harvested. The new construction keeps progressing and can soon be inhabited. But it still needs a name. We are still looking for one and ask our friends and sponsors to make suggestions. Please post your ideas as comments. If possible the name should only be one word. The winning name comes with an award to the name giver----something small from Kenya ;) try your lack! This years board meeting took place on the 16th of June at 11 o'clock at the Redeemer Church "Erlöserkirche" in Bad Homburg. All Board members, Organization Members and Sponsors were cordially invited. The Swahili page is now online and we hope that the page crow in the next time and will support by the Kenian-Team. 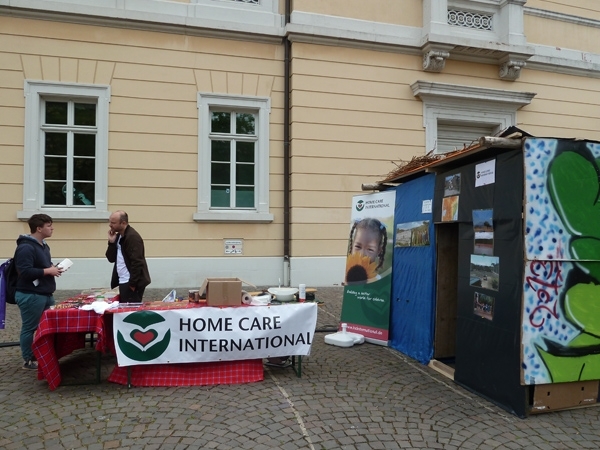 Home Care International will have an information desk at this year's youth congress "Good-Days and Nights 2012" in Michelstadt. 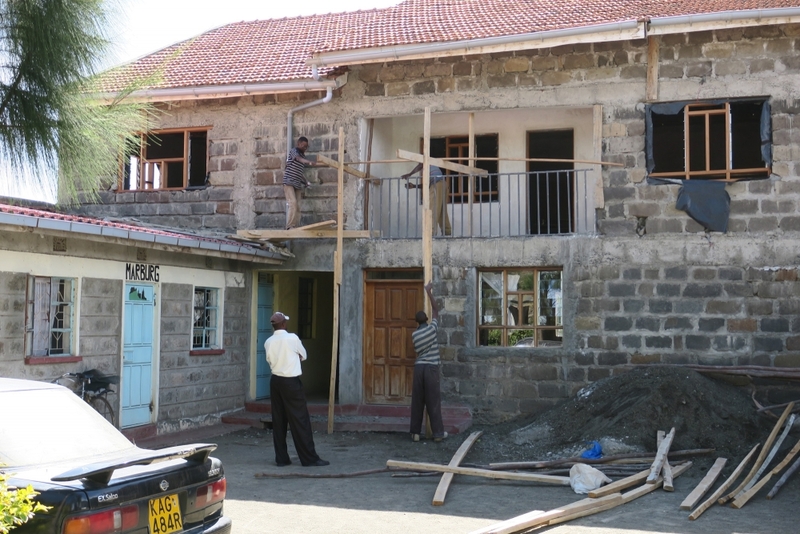 On June 8th and 9th from 10 am to 7 pm James and other HCI voluntueers are going to present and desplay its work and projects in Kenya with the purpose of winning more sponsors and more donations for the construction of the new children's development center. For further information concerning the youth congress please have a look here: www.good-days.de. Ask for our latest newsletter!